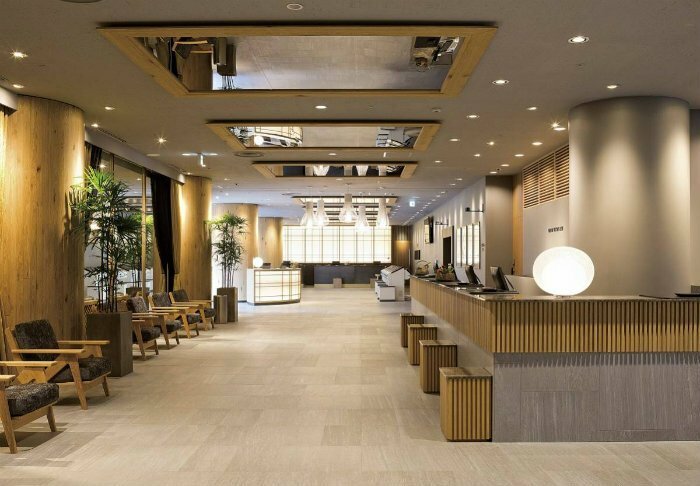 Here, you can find out more about the hotels that we use during our tours to Japan. You can also see pictures of the various places. 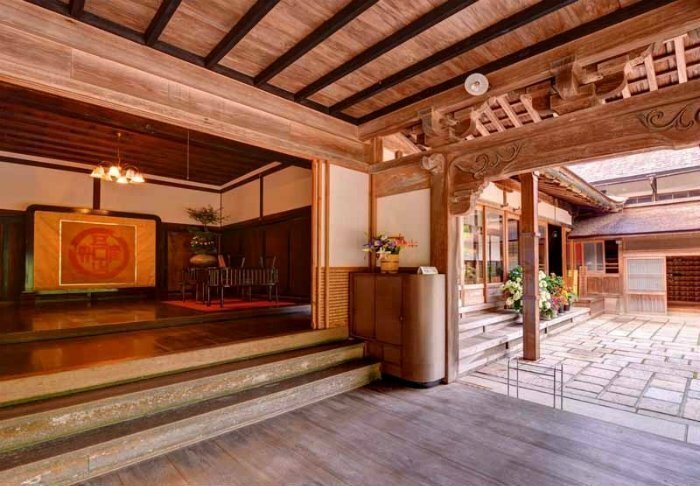 Situated on the banks of the Hayakawa River in Hakone is this old ryokan from 1630, Tonosawa Ichinoyu Honkan. 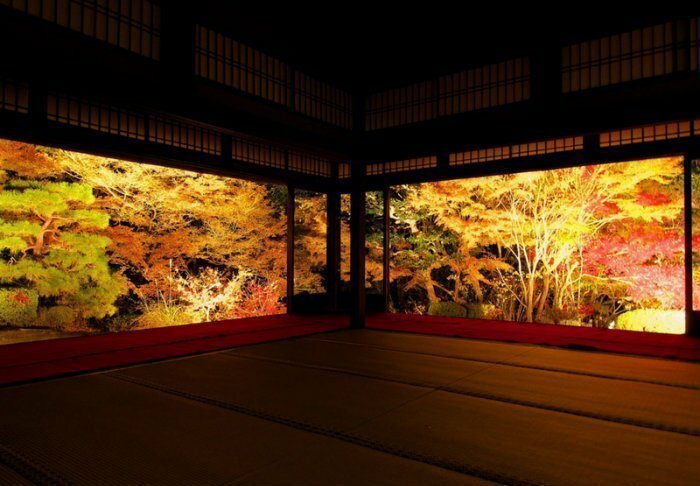 Tonosawa Ichinoyu Honkan has a total of 22 traditionally appointed rooms with tatami mats, which are classic Japanese mats made of rice straw. 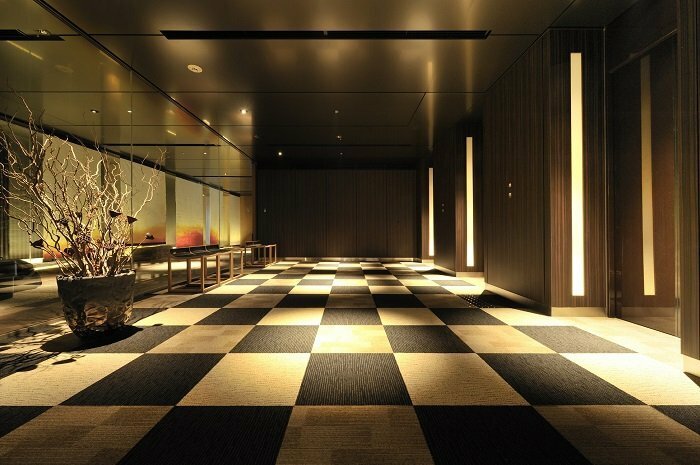 Tatami mats have a temperature element that makes them cool in the summer and warm in the winter. 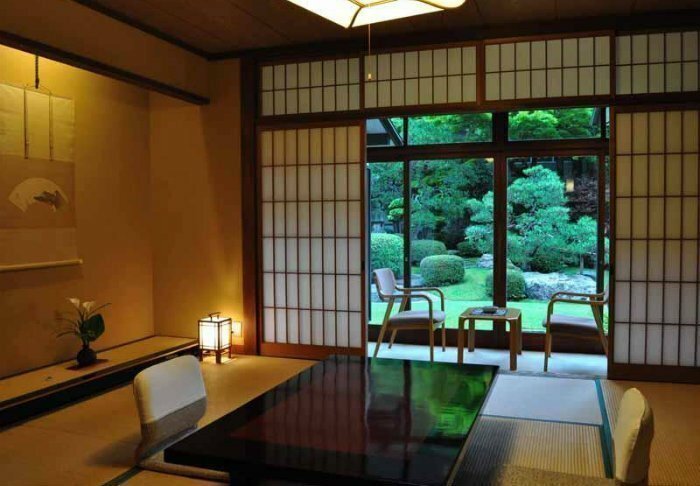 The rooms also have traditional “shoji”, Japanese sliding doors made of rice paper on a wooden frame. 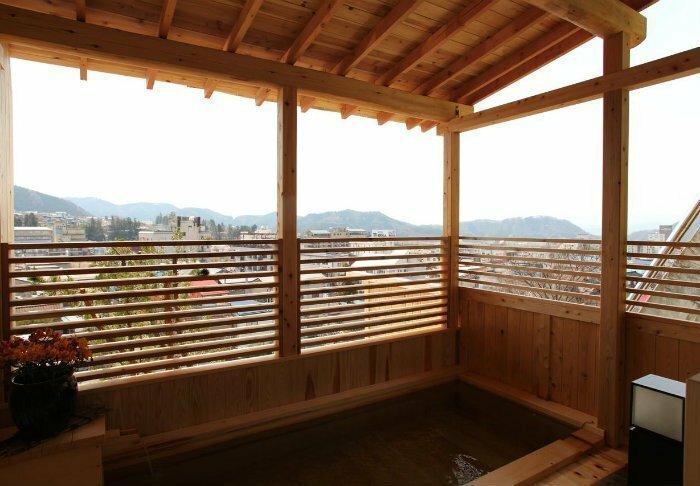 The thinness of the rice paper allows light to flood into the room, but without you being able to see through it, preserving privacy. 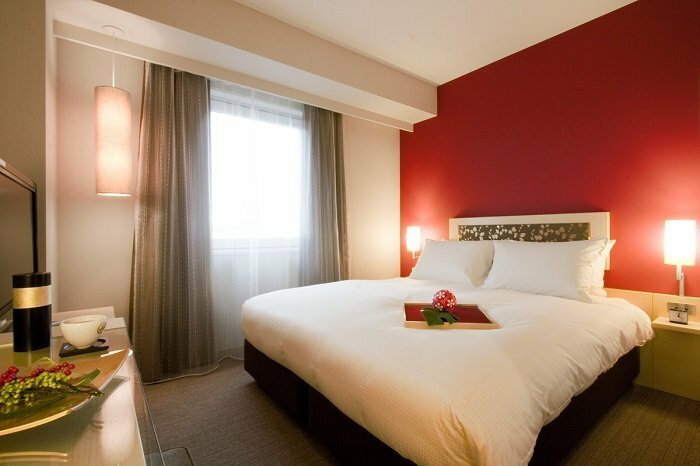 When it’s time for bed, you will snuggle down on a traditional futon. 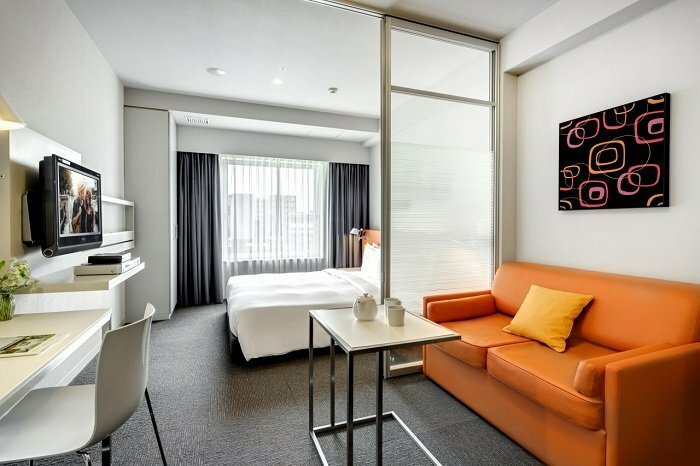 The rooms are also equipped with Wi-Fi, air conditioning, a fridge, TV, an en suite bathroom and an electric kettle, so you can enjoy a cup of green matcha tea at the short-legged table. 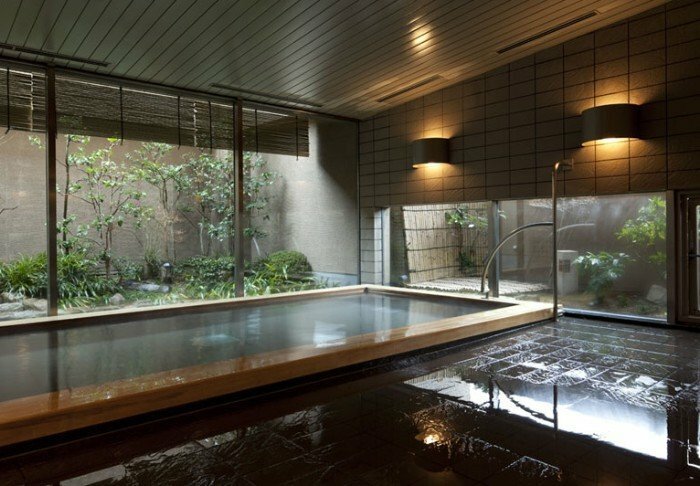 This ryokan has gender-separated onset baths, a dining room as well as a souvenir shop selling local products. 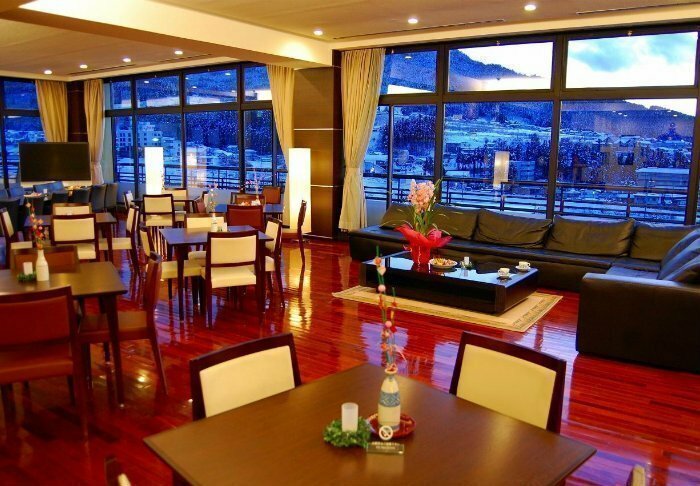 The breakfast and dinner, both of which are included in your stay, are served in the dining room. 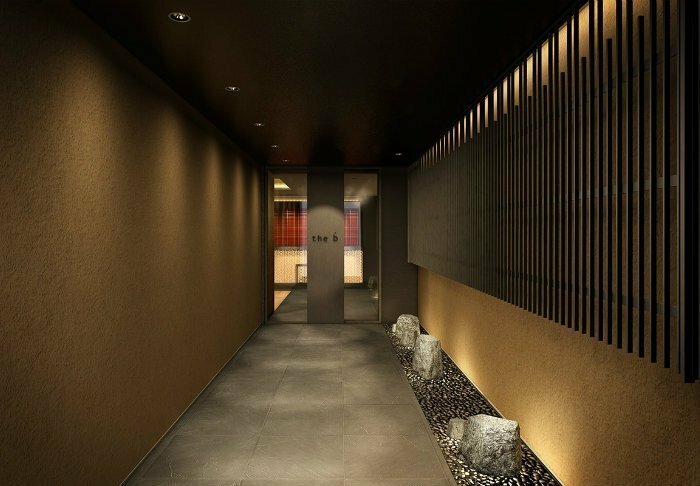 In the morning or evening, you can slip into a traditional yukata kimono and visit the day spa, where you can enjoy a range of massages and facial treatments. 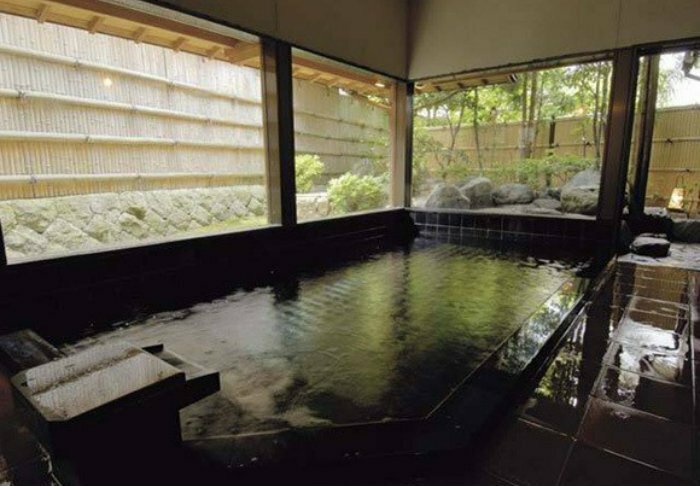 Read more about staying at ryokan here. 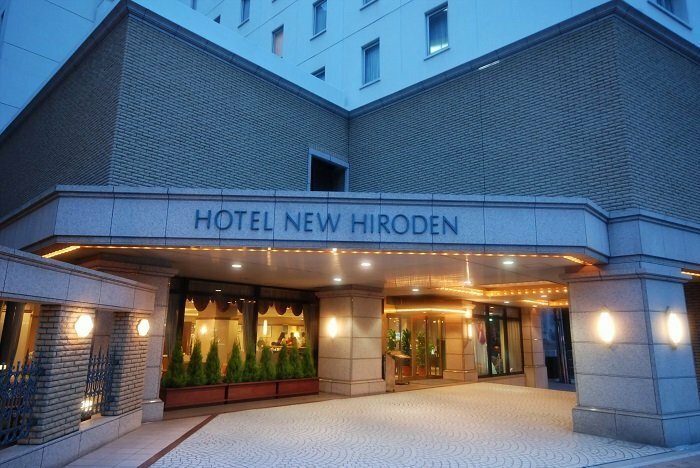 The 3-star Hotel New Hiroden is located in the heart of Hiroshima, approximately 5 minutes’ walk from Hiroshima Station. 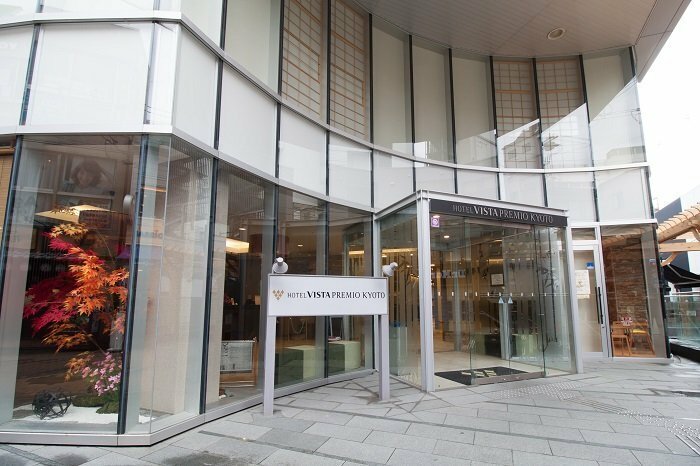 It is about a 15-minute walk from Hiroshima Castle, and the same to Hiroshima Peace Memorial Park. 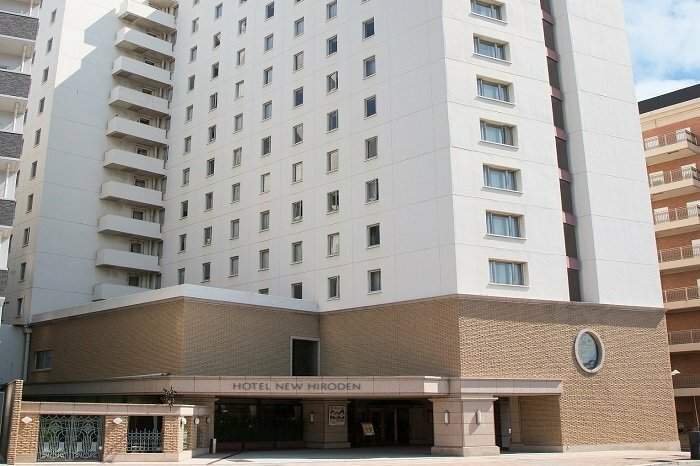 The 15-storey hotel has approximately 250 rooms with air conditioning/heater, mini fridge, electric kettle and flat screen TV with pay-per-view channels. 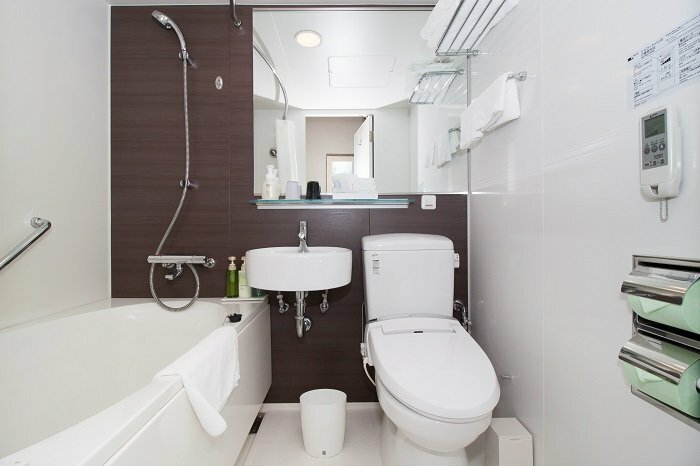 The bathroom is a classic prefabricated bathroom with toilet, hand basin, shower in the bathtub, hair dryer and toiletries. There is free Wi-Fi in the rooms. 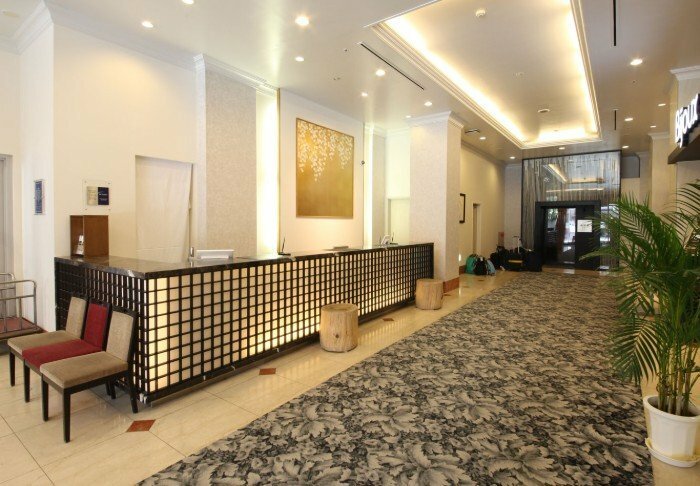 The hotel offers massages (fee payable) and has three restaurants. 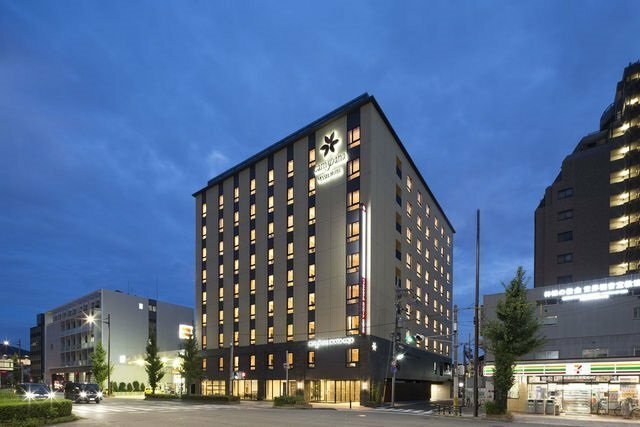 The 3-star Resol Trinity hotel is just a few minutes on foot from Kanazawa’s famous Omicho market, and is right next to the Nagamachi samurai district. In short; a fantastic location. 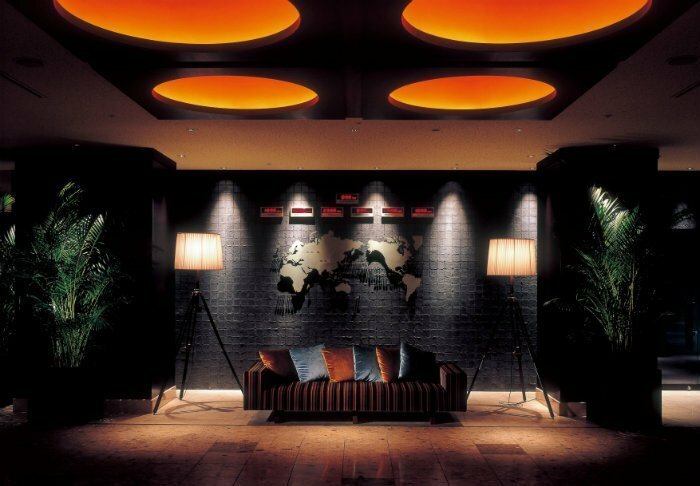 The hotel has 123 rooms with modern, stylish interiors. 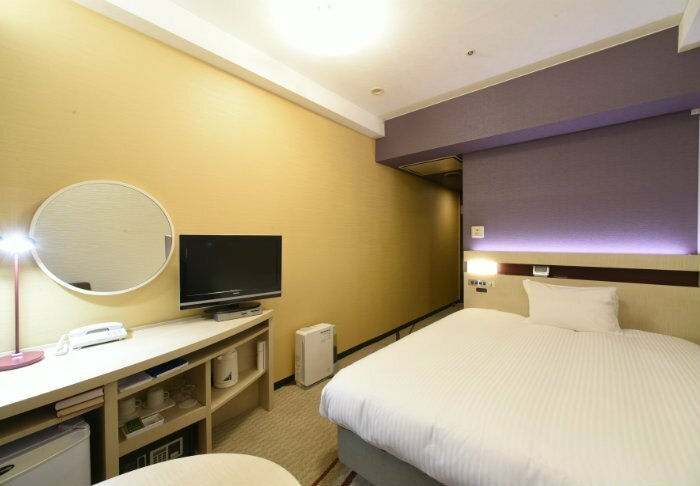 All rooms feature a refrigerator, TV, air conditioning and an electric kettle. The bathroom is a classic prefabricated bathroom with a toilet, a hand basin, a shower in the bathtub, a hair dryer and toiletries. 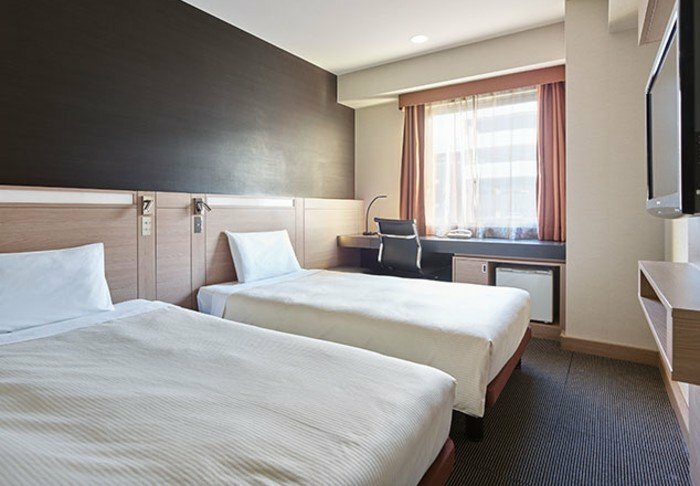 The hotel offers free Wi-Fi and features a coin laundry. 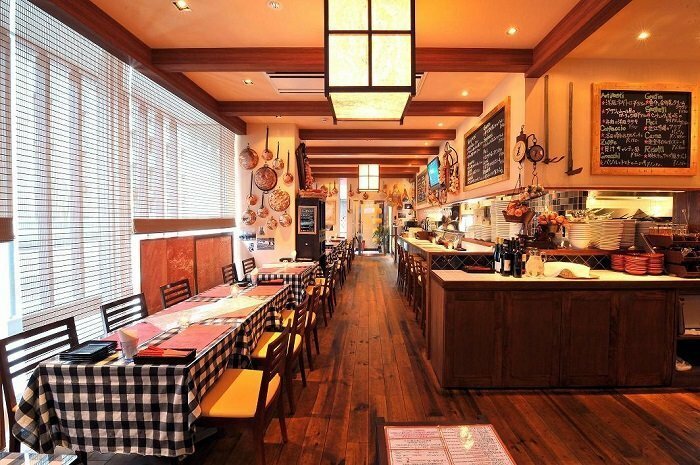 An Italian restaurant is available here as well. 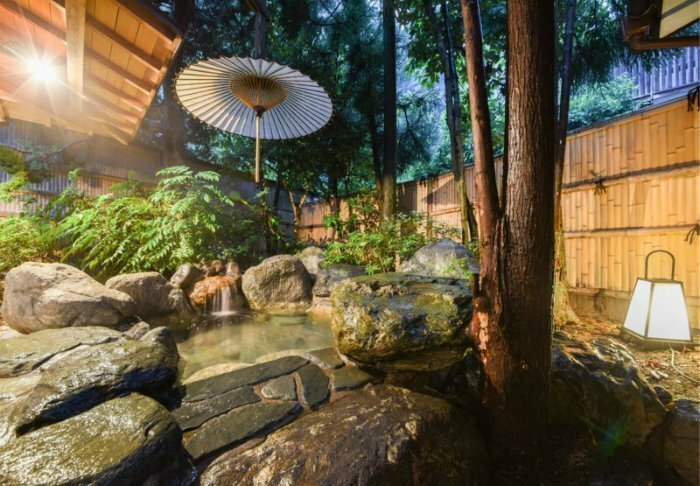 This wonderful ryokan is located a mere 15-minute walk from Kinosaki Onsen’s famous onsen hot spring baths. 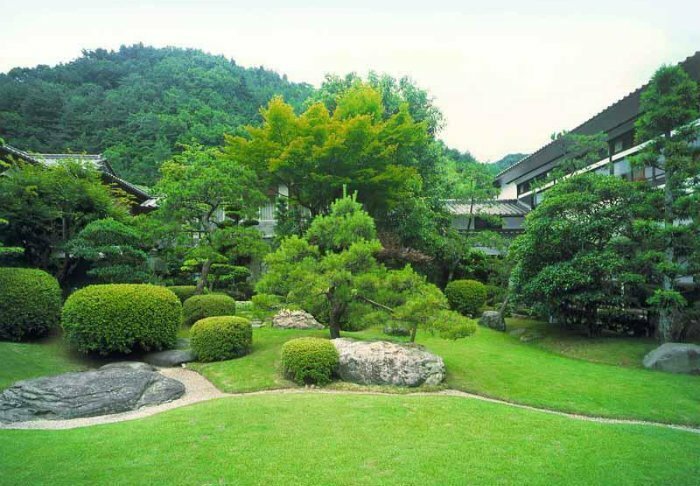 Tokiwa Bekkan has a total of 23 rooms with beautiful views of the lush, well-kept Japanese gardens. 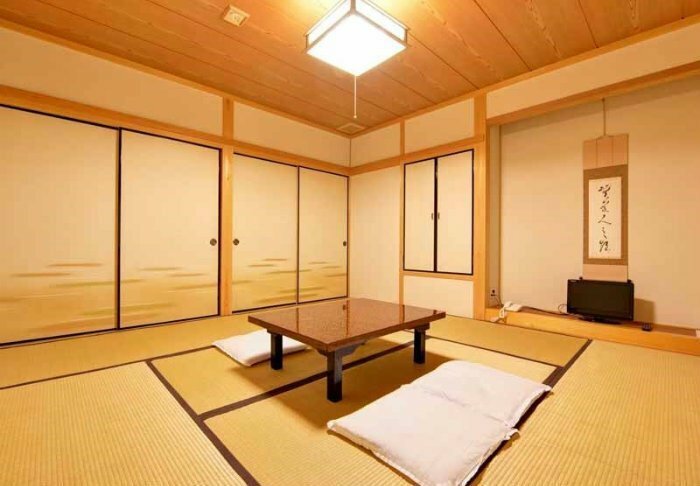 The rooms are all decorated in traditional Japanese style with tatami mats, shoji sliding doors and short-legged tables. 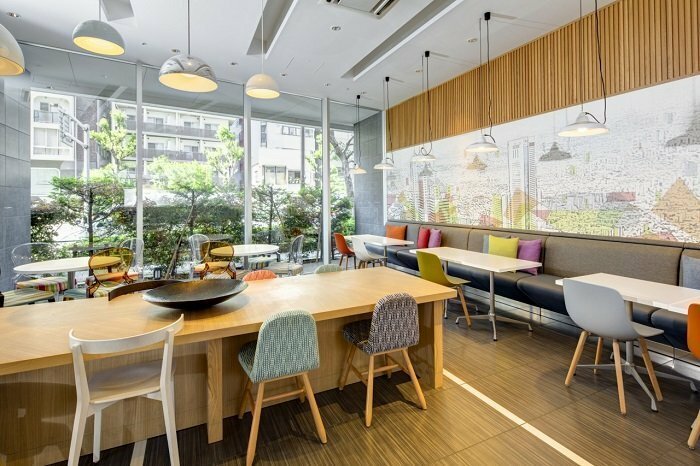 The natural colours and simple elements provide a calm, warm atmosphere. 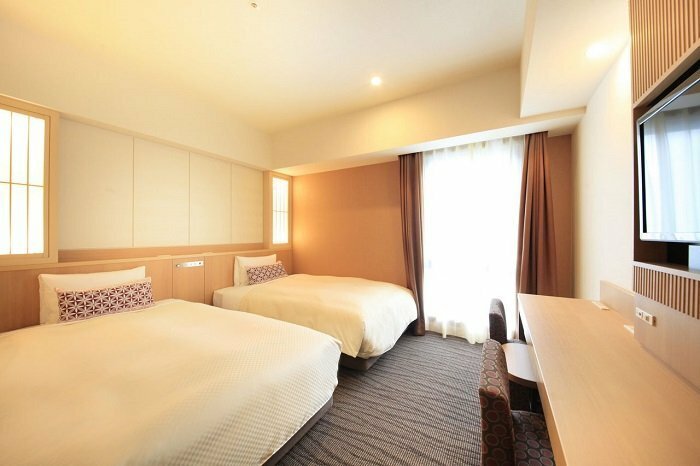 The rooms also feature comfortable traditional futon beds, as well as a TV, fridge, yukata kimonos and an en suite bathroom with toiletries and a hair dryer. 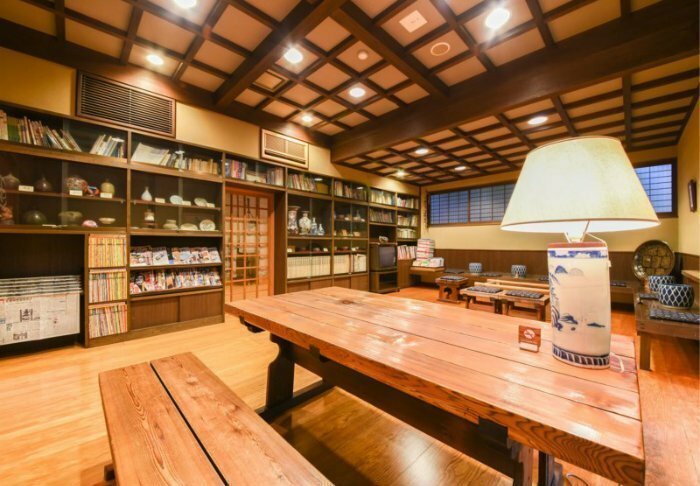 Amenities include a gender-separated onsen bath, library and souvenir shop. 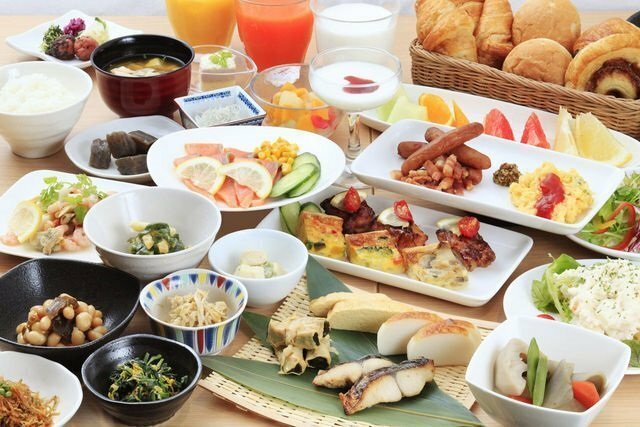 A traditional Japanese breakfast is served in your room. 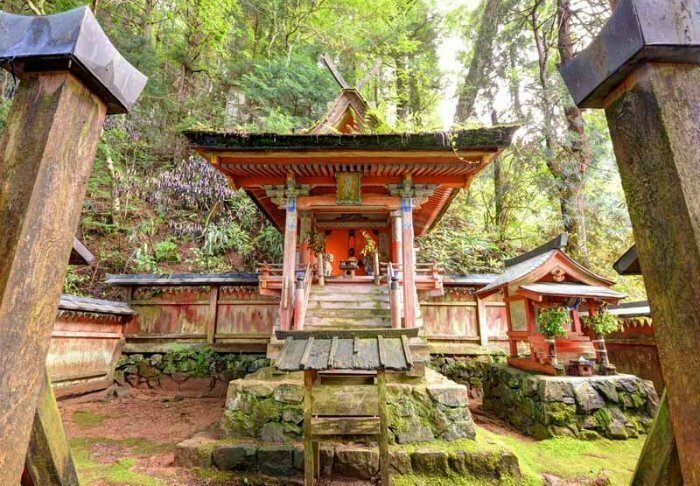 How many people can claim to have stayed in a temple complex with more than 800 years of history behind it? Well, you can soon! 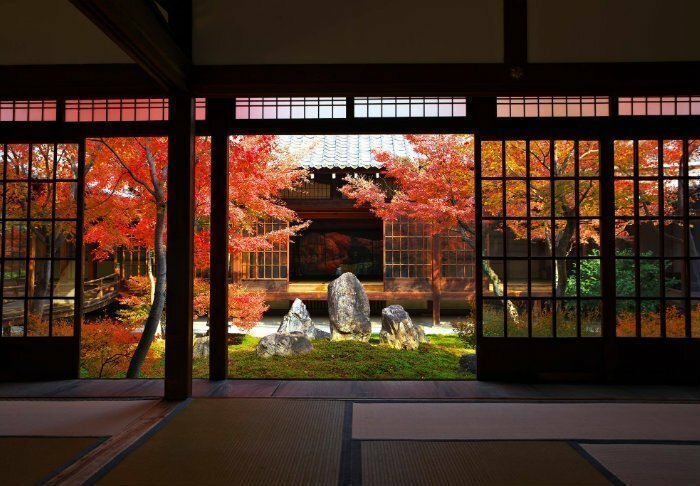 Kongo Sanmai-in functions both as a temple and ryokan. 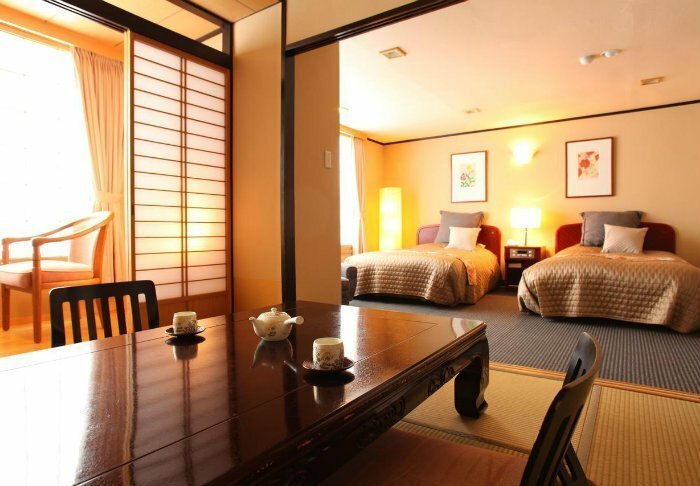 The rooms have the finest Japanese tatami floors, dark brown short-legged tables, shoji windows and futons. They also feature air conditioning, Wi-Fi, a TV, a safe and a toilet. 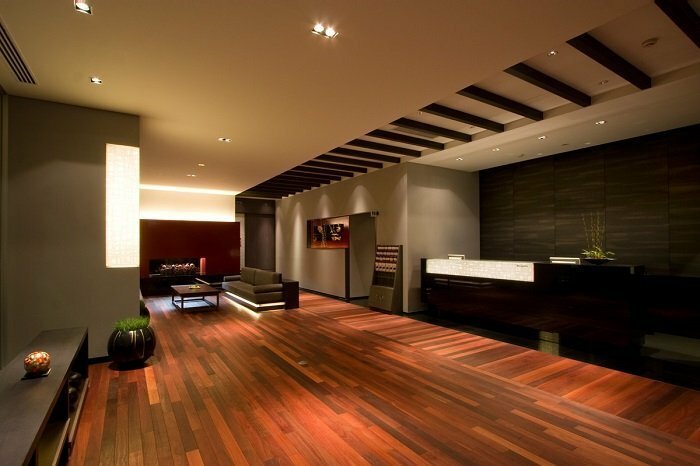 The bathroom itself is in the hallway and is shared with others. 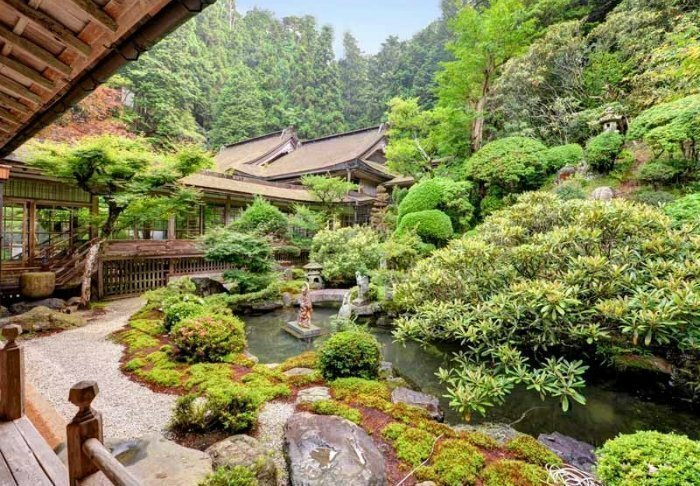 Outside your room, you can enjoy the beautiful Japanese garden with its pretty rhododendrons, maples, bonsai trees and small ponds. 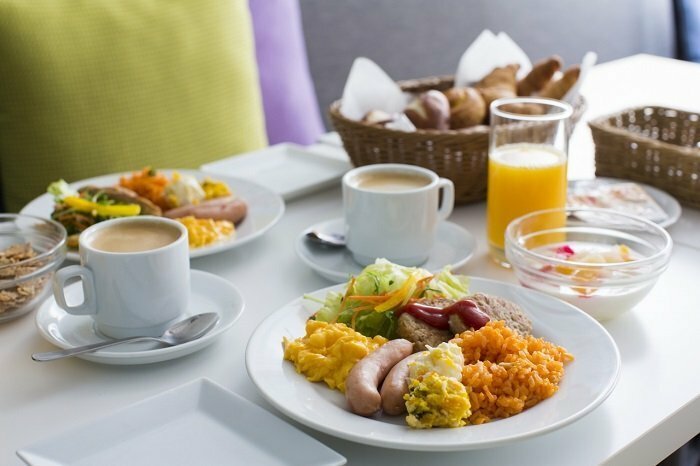 In the morning, you can choose to attend the monks’ morning prayer, after which a Buddhist, vegetarian meal will be served. 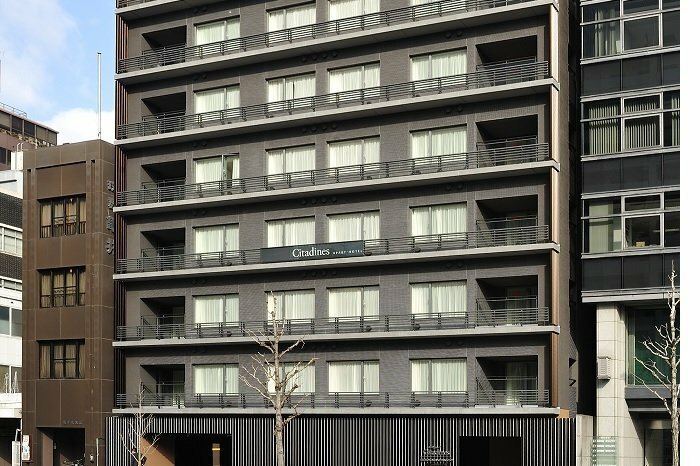 The 3-star Citadines Kyoto Karasuma-Gojo has a central location between the Kyoto train station and the geisha district of Gion, approx. 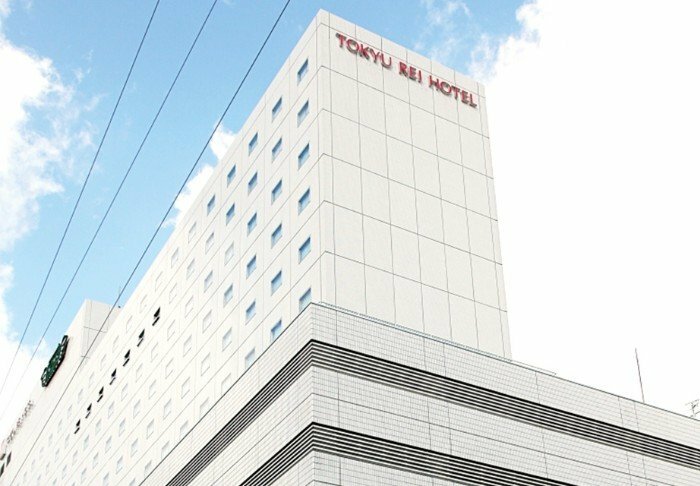 10 minutes on foot from Kyoto station and approx. 15 minutes from Gion. 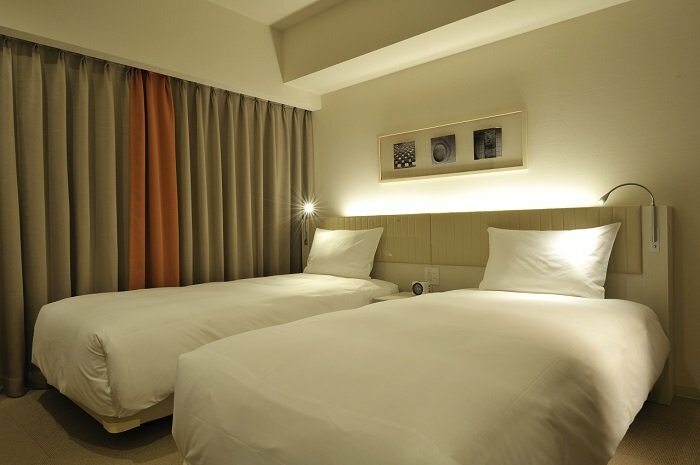 The hotel has 124 apartments including a kitchenette with micro-wave oven, refrigerator, electric kettle, a cooking area and utensils. Cleaning is done daily. 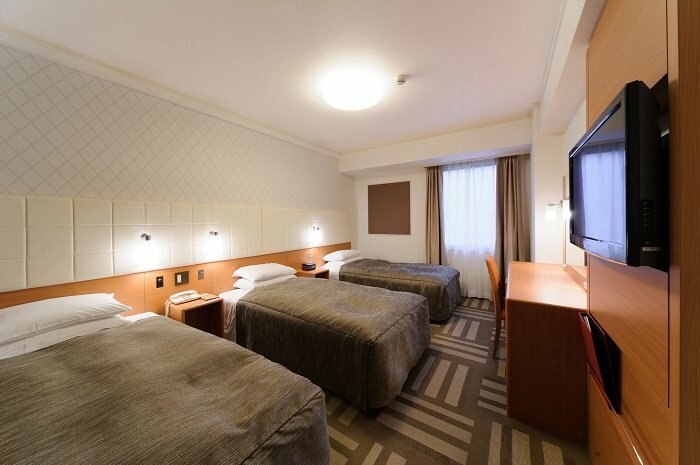 The rooms also feature air conditioning/heating, a flat-screen TV and a desk. The bathroom is a classic prefabricated bathroom with a toilet, a hand basin, a shower in the bathtub, a hair dryer and toiletries. Free Wi-Fi is available at the hotel as well. 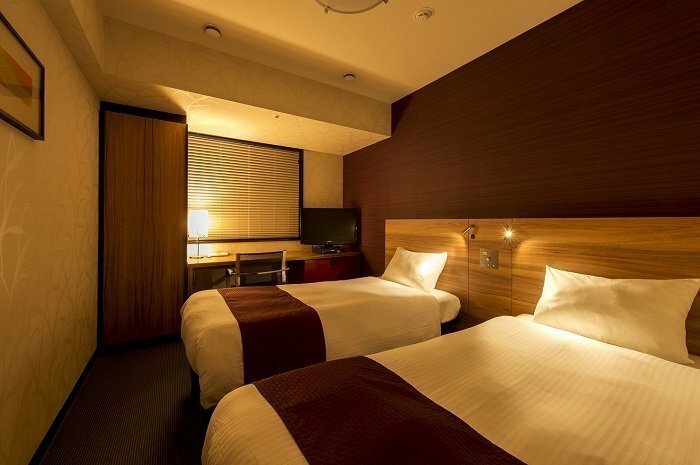 The 3-star Hotel Vista Premio Kyoto is a 5-minute walk from the Kamo river and approx. 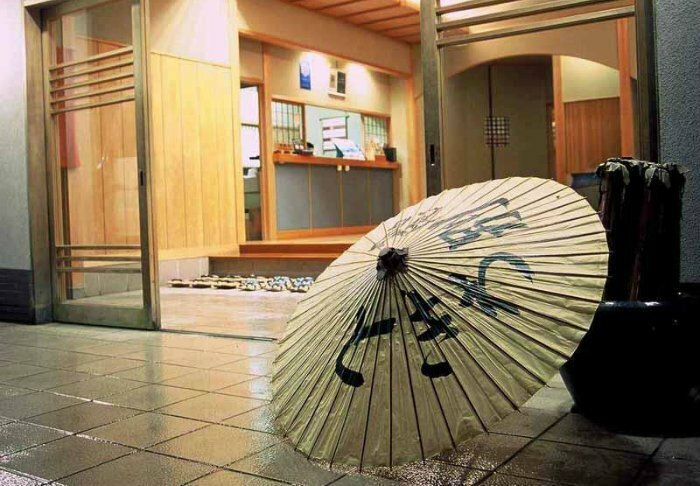 10 minutes on foot from the geisha district of Gion. 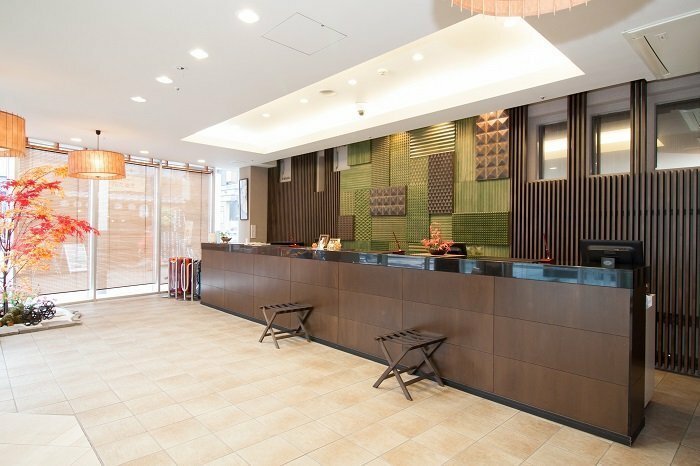 The hotel is surrounded by shops and restaurants, including the famous Nishiki food market, which is located just next to the hotel. In the streets, you will encounter many people dressed in kimono for a day. 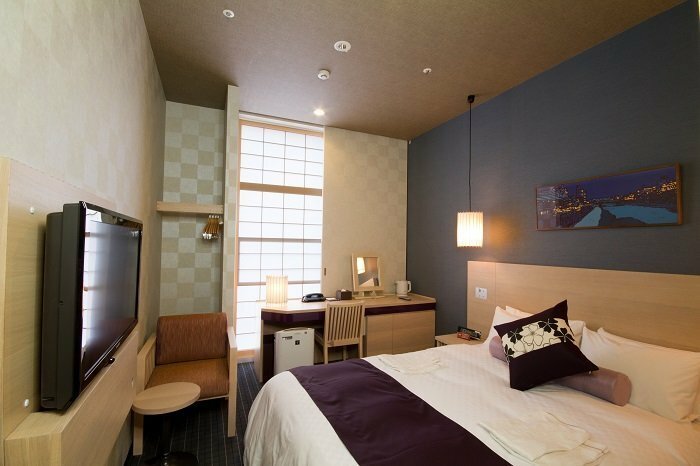 The hotel is located in a 6-storey building and contains about 80 modern rooms with a touch of Japanese tradition. 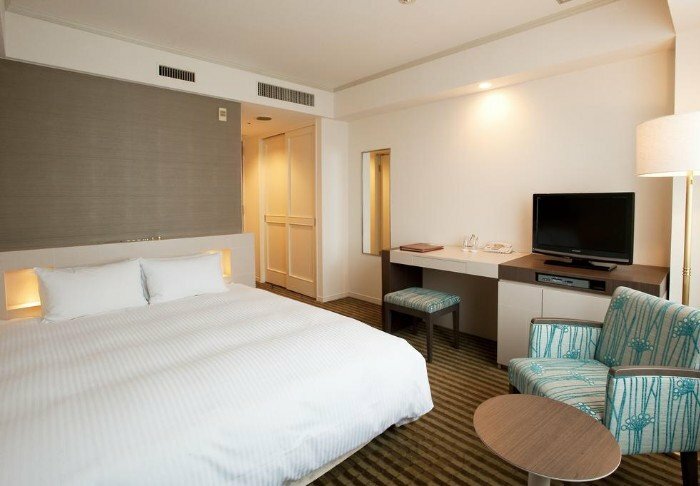 All rooms feature air conditioning, a refrigerator, and a flat-screen TV with satellite channels and pay-per-view. The bathroom is a classic prefabricated bathroom with a toilet, a hand basin, a shower in the bathtub, a hair dryer and toiletries. 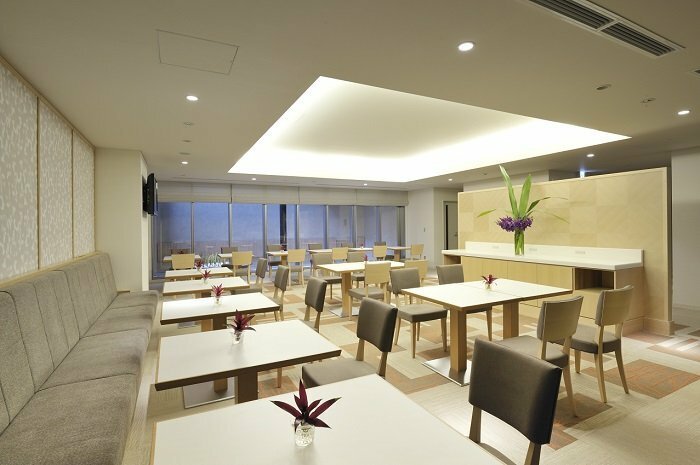 The hotel has 2 restaurants and features free Wi-Fi in the common areas. 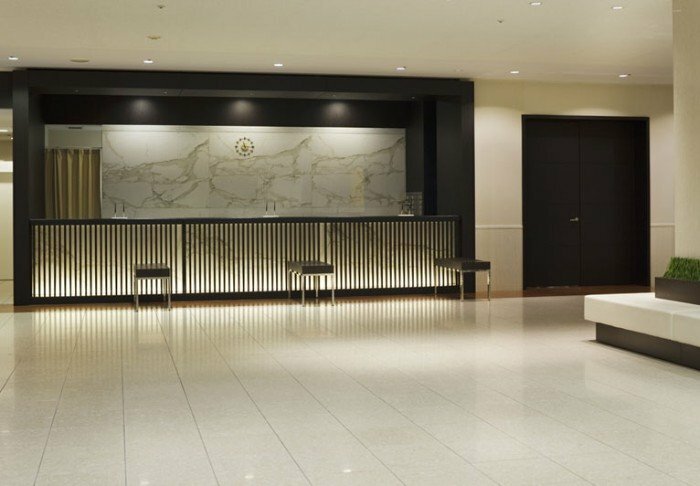 The B Kyoto Shijo opened on 1 September 2018 and reflects Kyoto’s beauty and Japanese tranquility. 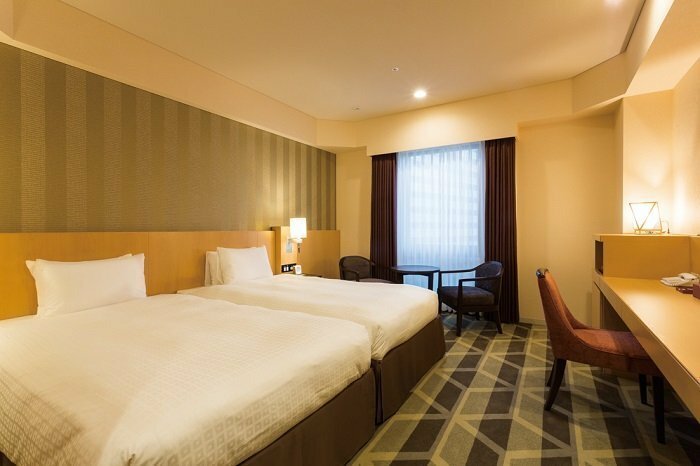 Within walking distance of the hotel are the famous Nishikishi market, the popular shopping street, Teramachidori, and the four stations Shijo, Shijo Omiya, Karasuma and Omiya. 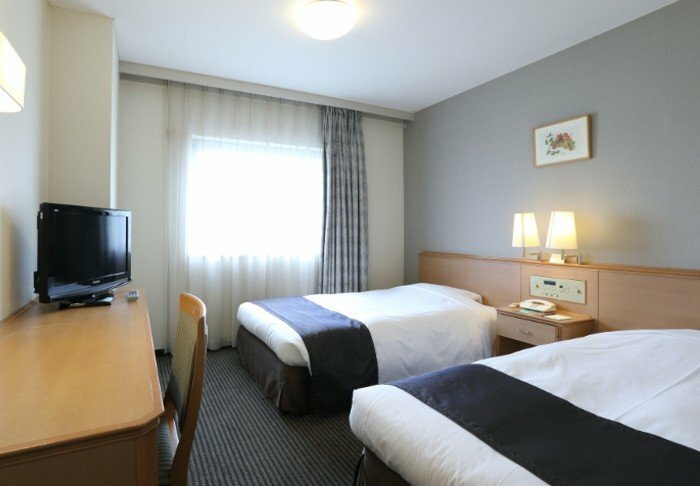 The hotel has 146 simple, modern rooms, all with a desk, free Wi-Fi, air conditioning, fridge, tea/coffee making facilities, a hair dryer and toiletries. 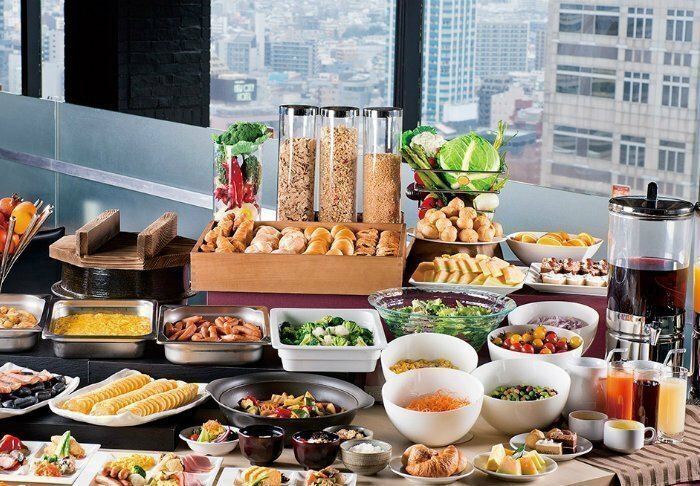 Breakfast is served in the restaurant, which is open from 7 to 10 am. 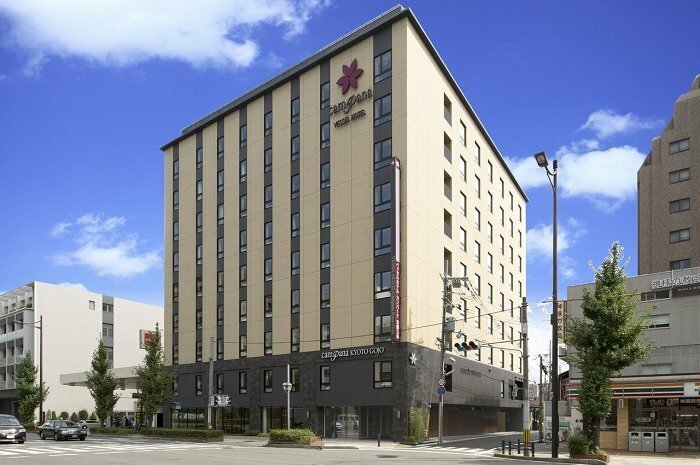 The 3-star Vessel Hotel Campana Kyoto Gojo is at the heart of Kyoto, up close to the Kamo river, approximately between the JR railway station and the geisha district of Gion. Many shops and restaurants can be found in the area around the hotel. 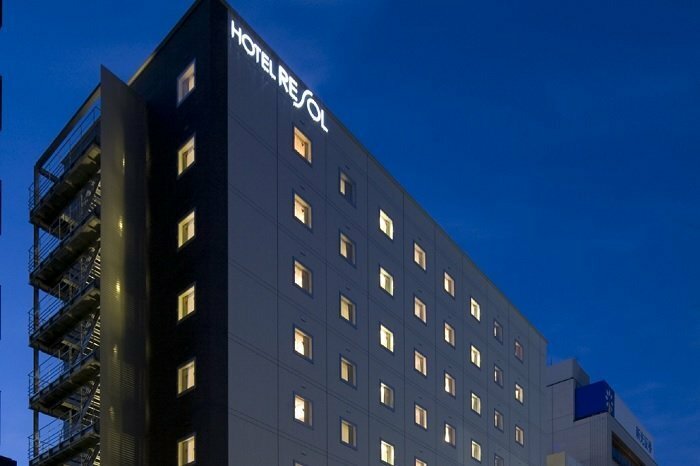 The hotel has approx. 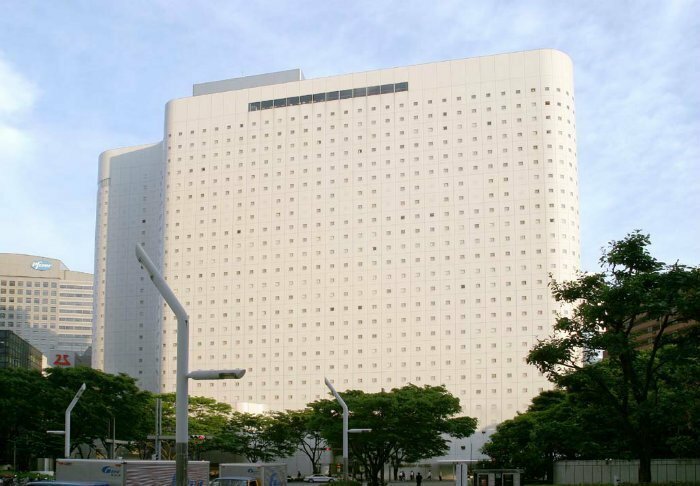 235 rooms, all of which feature air conditioning, flat-screen TV, a desk, a refrigerator and an electric kettle. 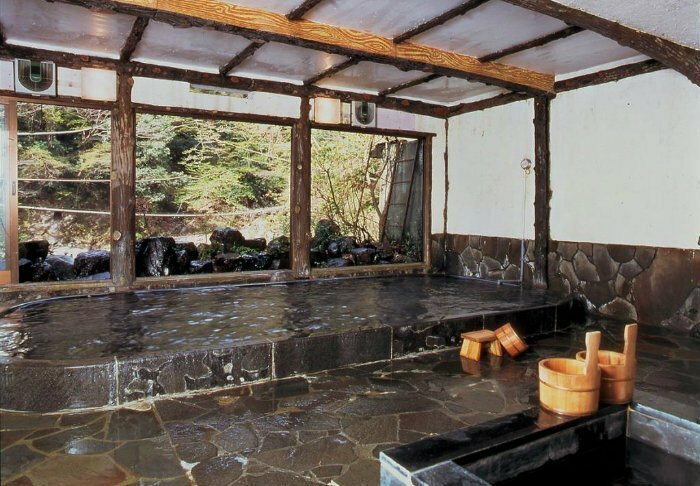 The bathroom is a classic prefabricated bathroom with a toilet, a hand basin, a shower in the bathtub, a hair dryer and toiletries. 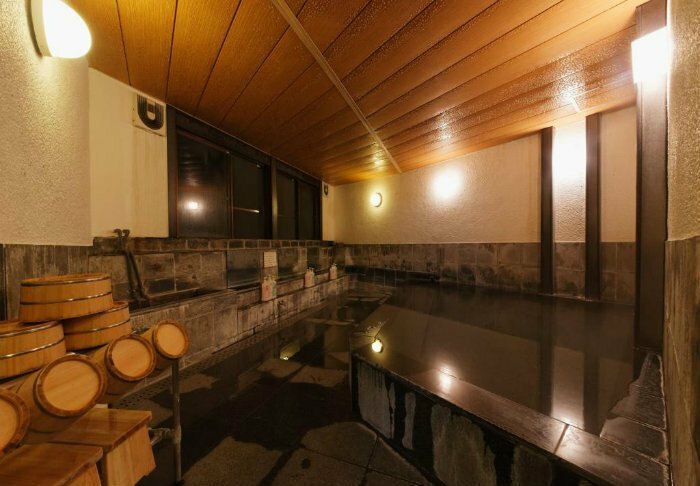 At the hotel, you can also find an onsen with sauna, a restaurant, and bicycle rental. Massage is available for a fee, paid separately. 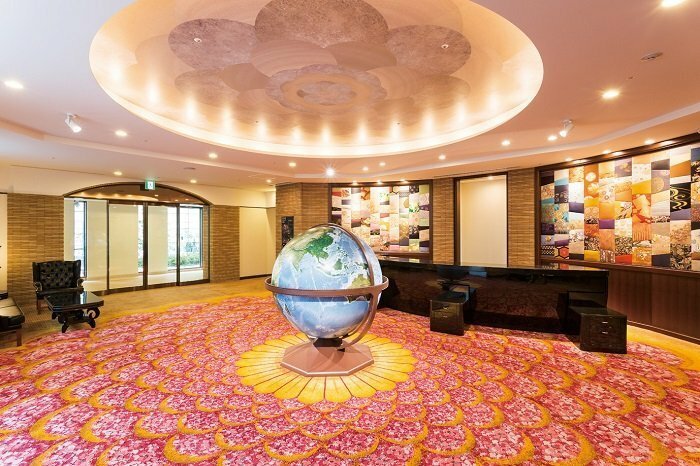 The 4-star Matsumoto Buena Vista Hotel is located in the heart of Matsumoto. 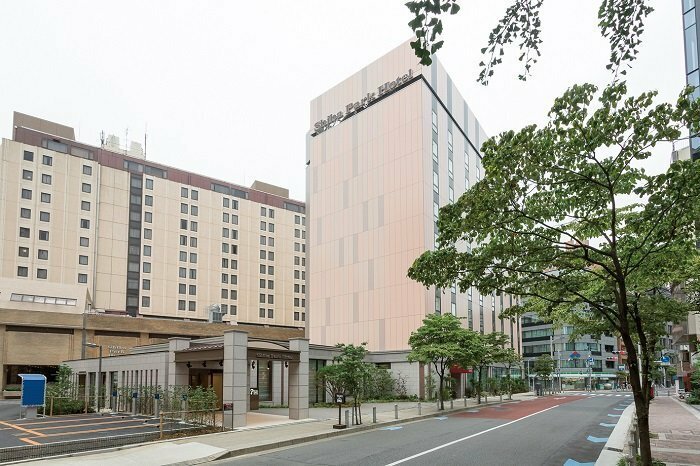 A free shuttle bus runs regularly between the train station and the hotel. 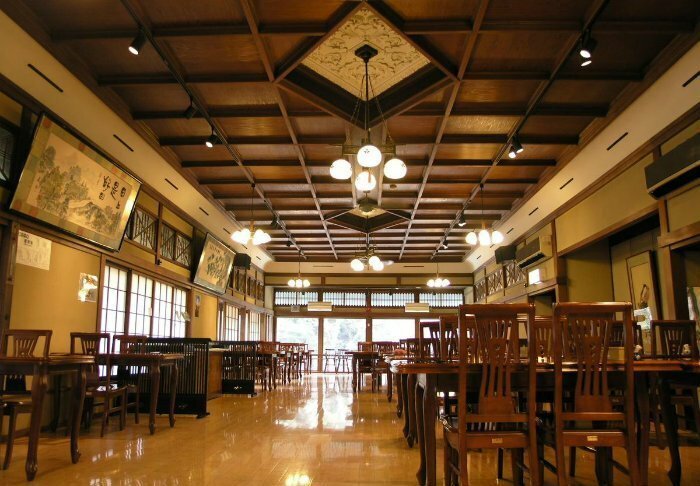 In just 15 minutes, you can walk to the historical and extremely beautiful Matsumoto. 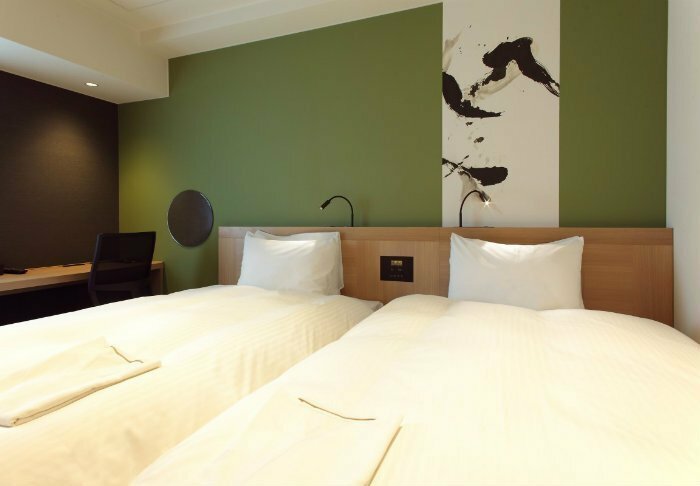 The hotel’s rooms are decorated in bright, natural colours. 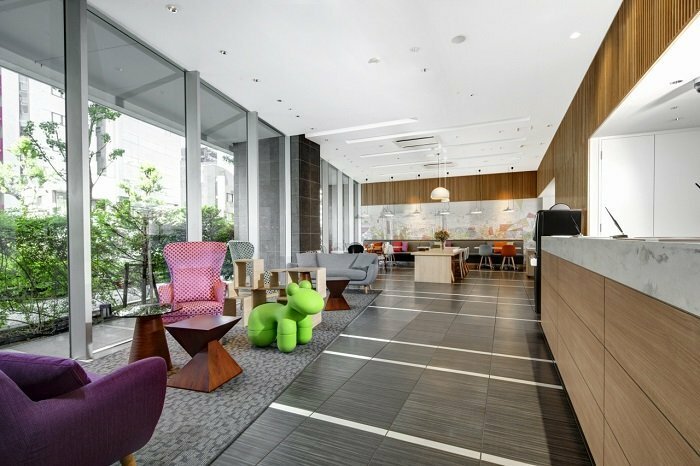 They all have a small seating area and modern facilities such as Wi-Fi, air conditioning, a minibar, electric kettle and TV. 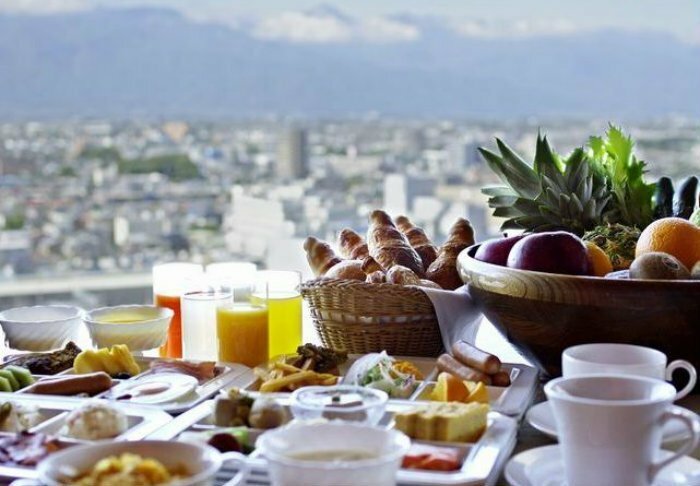 There is a breathtaking view of Matsumoto and the Japanese Alps from the hotel’s French restaurant on the top floor, where the breakfast buffet with both Japanese and Western dishes is served. 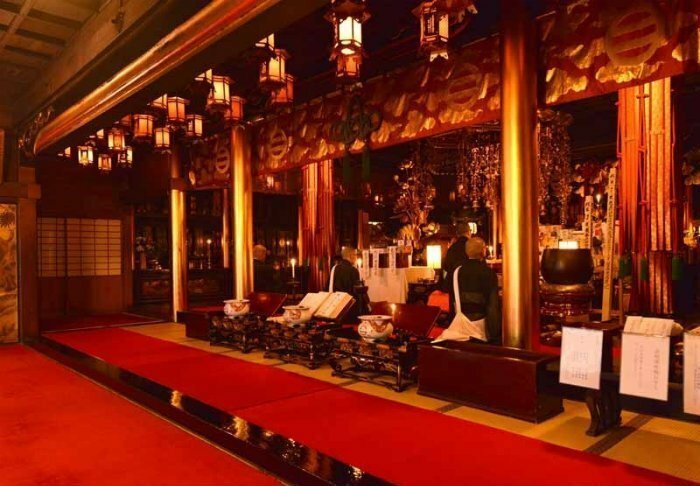 On the ground floor, you will find a small souvenir shop, a café and a Chinese restaurant. 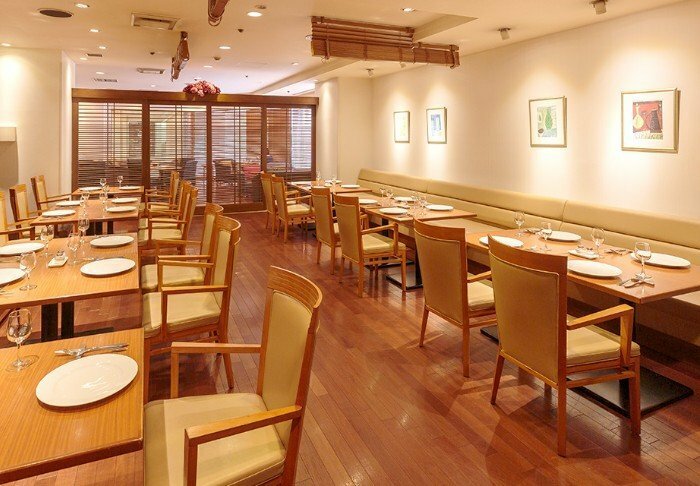 The hotel’s traditional Japanese restaurant is situated on the fifth floor. 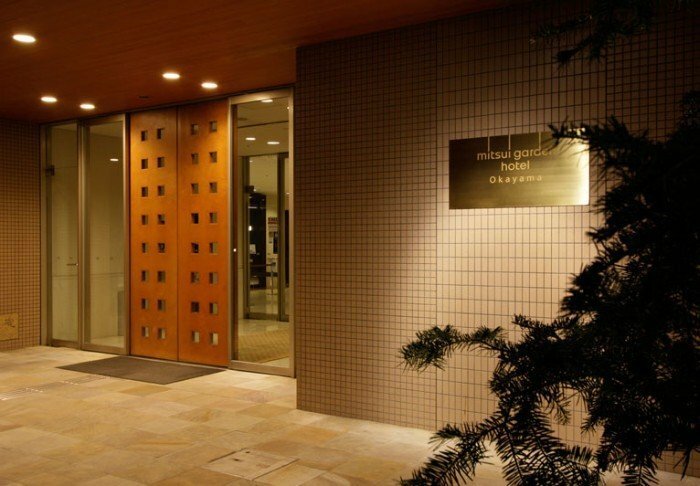 Guests can enjoy massages and beauty treatments at the hotel’s day spa, and there is free bicycle rental at the reception desk. 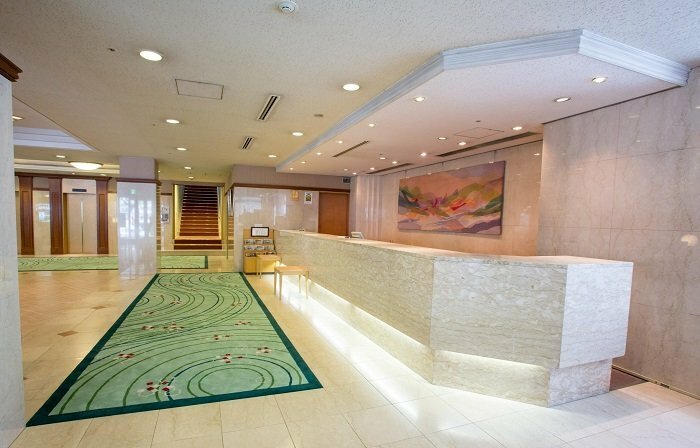 The 3-star Mitsui Garden Hotel is at the center of Okayama, a 2-minute walk from the JR Okayama train station. 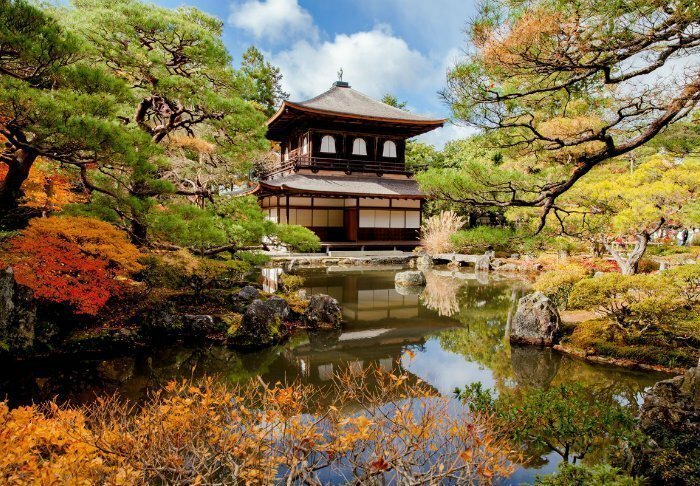 Okayama Castle and the Koraku-en park are approx. 10 minutes by car from the hotel. 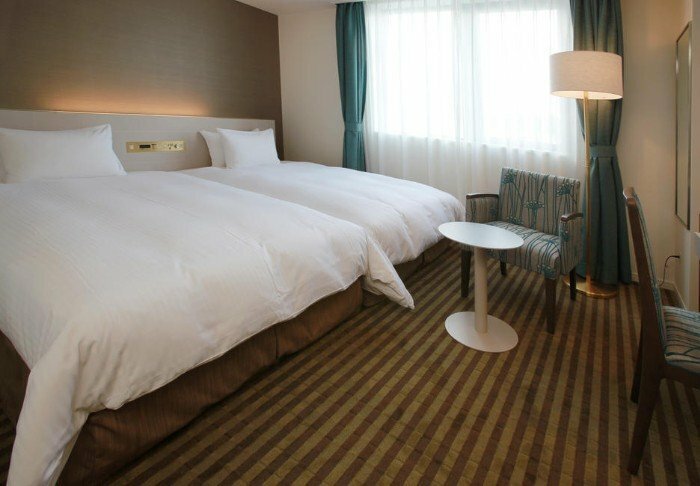 The hotel features approx. 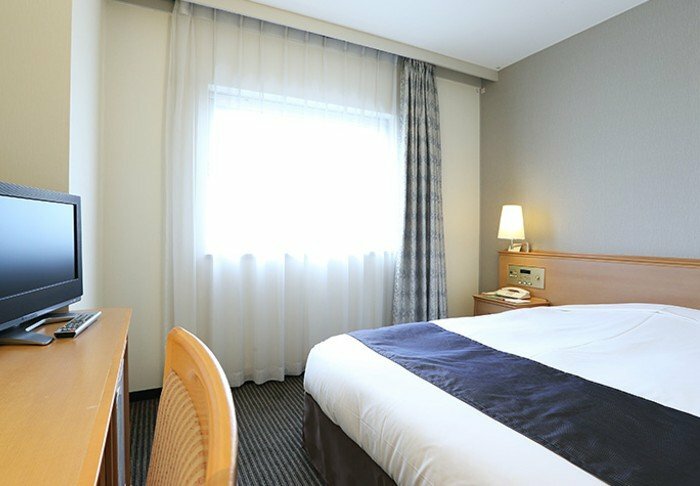 350 rooms equipped with air conditioning, a flat-screen TV with satellite channels and pay-per-view, a mini-fridge, a safe, as well as coffee and tea facilities. 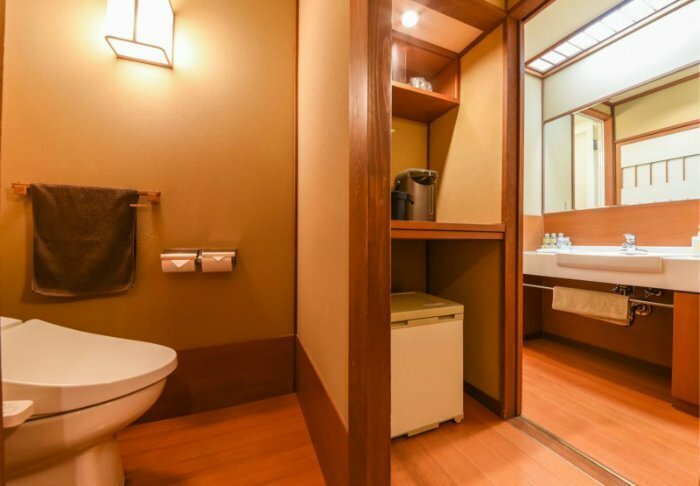 The bathroom is a classic prefabricated bathroom with a toilet, a hand basin, a shower in the bathtub, a hair dryer and toiletries. Free Wi-Fi is available all over the hotel, and the hotel offers massage for a fee, paid separately. 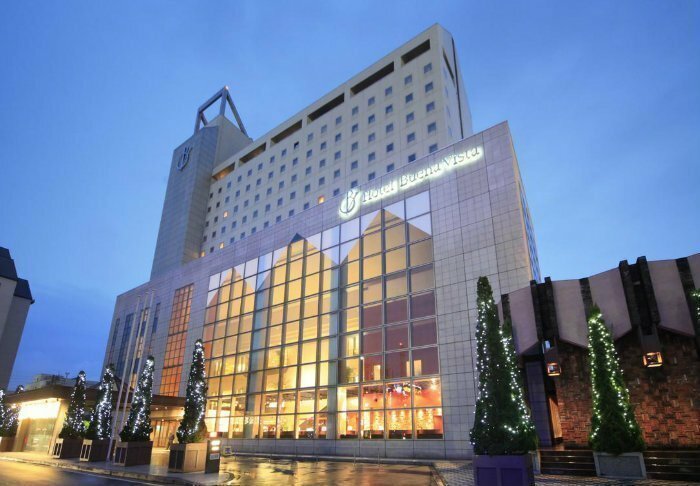 The 3-star Shin-Osaka Esaka hotel is a stone’s throw from the Esaka metro station in Osaka. 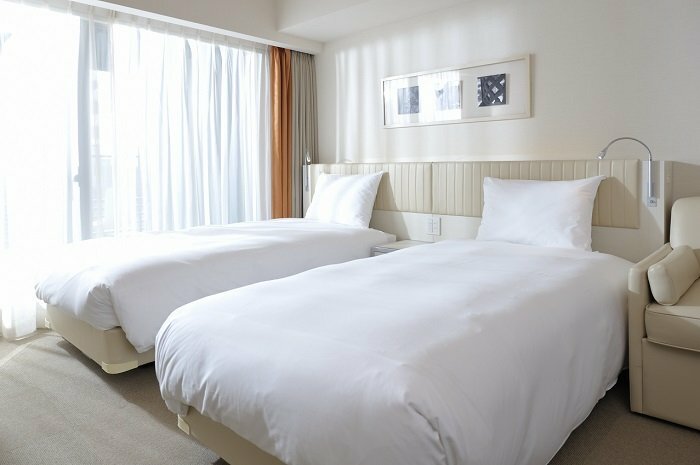 The hotel is located in the same building as the Tokyu department store, where you can buy everything plus the kitchen sink. 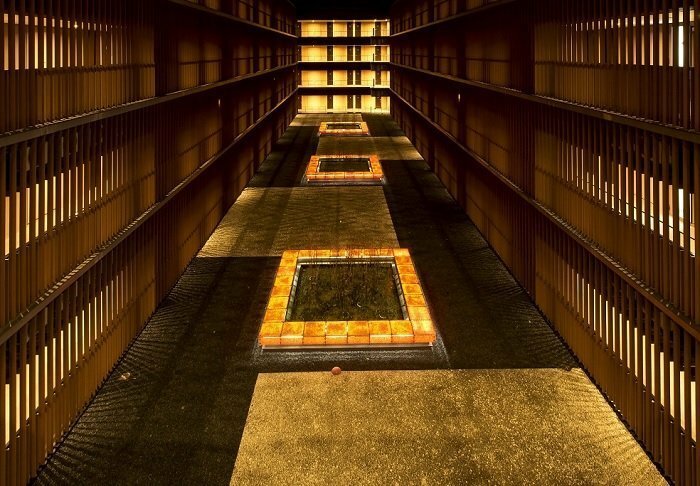 There are 363 rooms here, and they may be a bit on the smaller side. They have simple interiors, but feature everything you could need; TV, an electric kettle, a refrigerator and a safe. 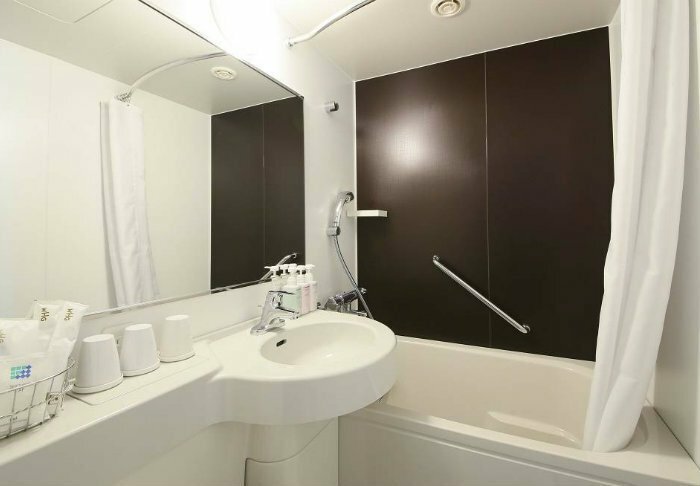 The bathroom is a classic prefabricated bathroom with a toilet, a hand basin, a shower in the bathtub, a hair dryer and toiletries. 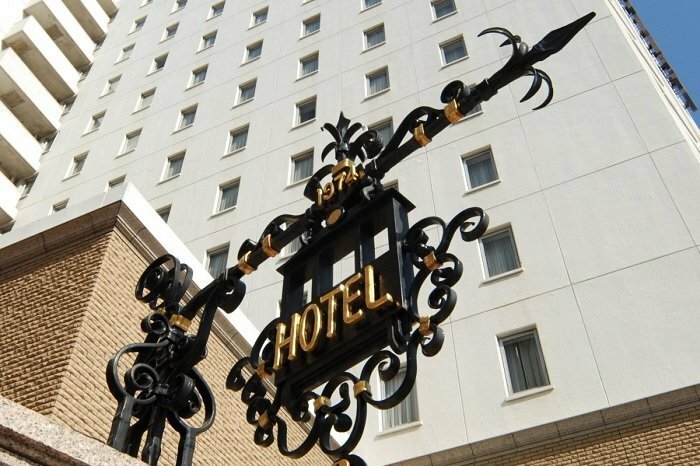 The hotel offers free Wi-Fi, mineral water in the rooms and a coin laundry. 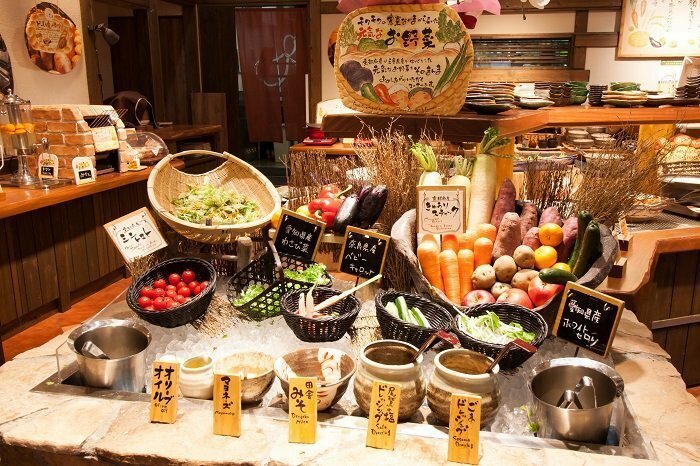 There is a restaurant at the hotel. 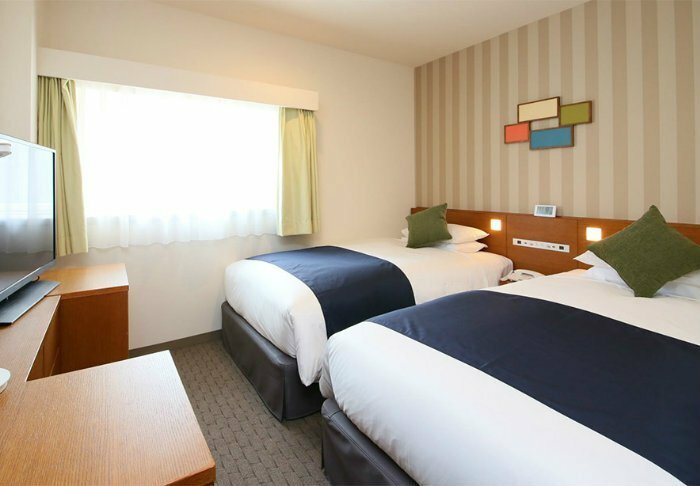 The 3-star Best Western Hotel is a stone’s throw from the Takayama train station. Here you are located right next door to attractions, shops and restaurants. 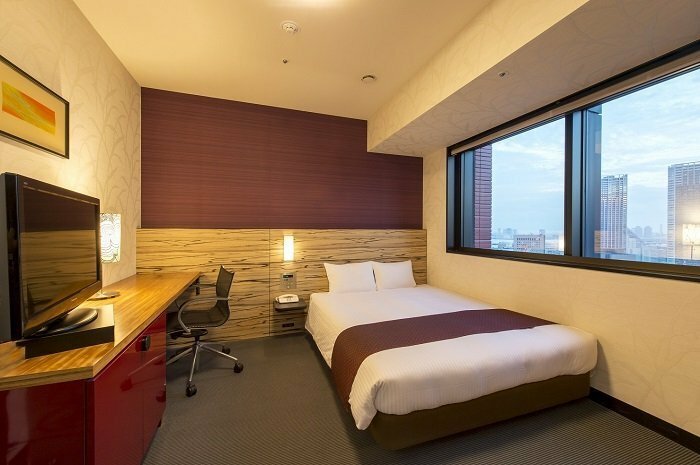 The rooms are small and feature fairly simple, yet attractive, interiors. 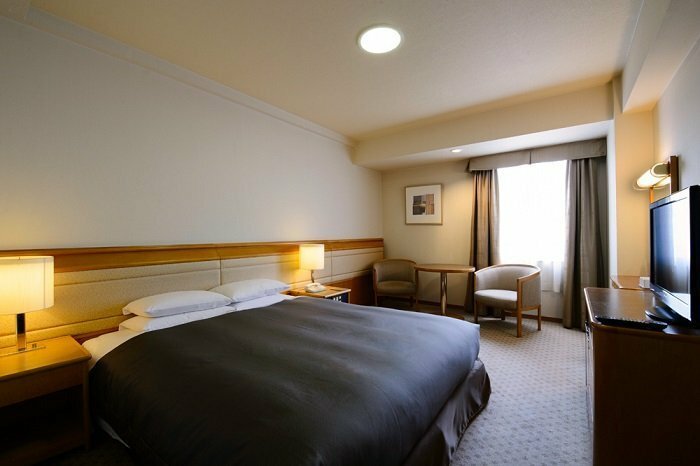 All rooms feature air conditioning, soundproofing, a refrigerator, TV and Wi-Fi. The bathroom is a classic prefabricated bathroom with a toilet, a hand basin, a shower in the bathtub, a hair dryer and toiletries. 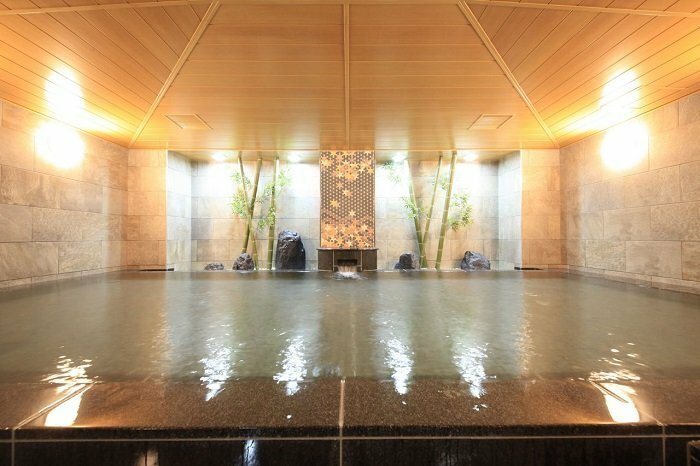 There is a restaurant at the hotel, and massage services are available (for a fee). 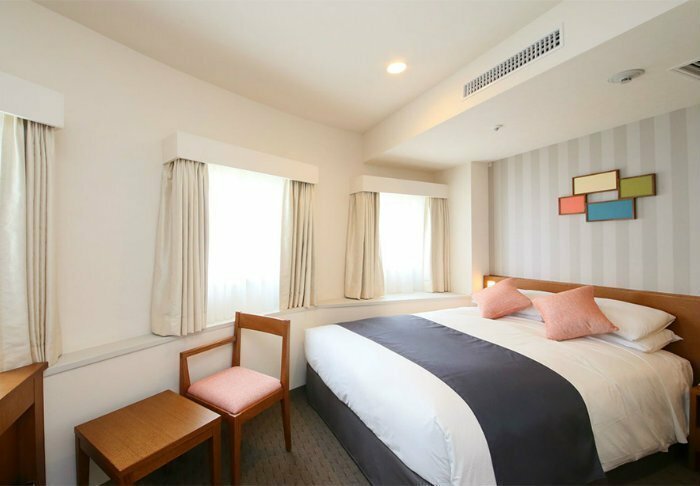 This 3-star apartment hotel is a quick 5-minute walk from the metro station, Shinjuku Gyoenmae, and is in walking distance from central Shinjuku. 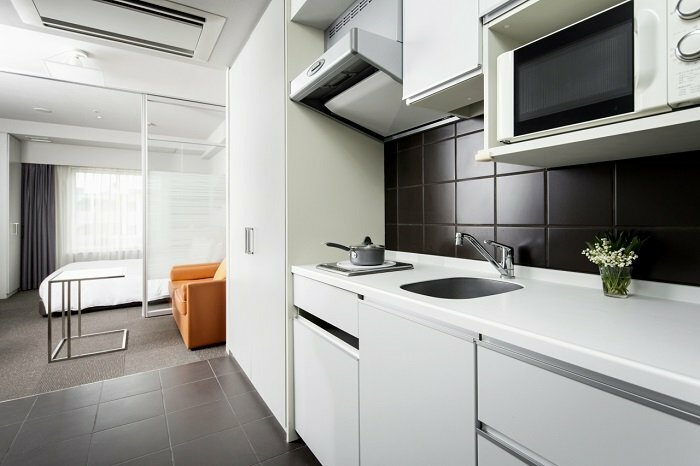 The hotel consists of 160 apartments, all featuring kitchenettes with a refrigerator, electric kettle, utensils and microwave oven. 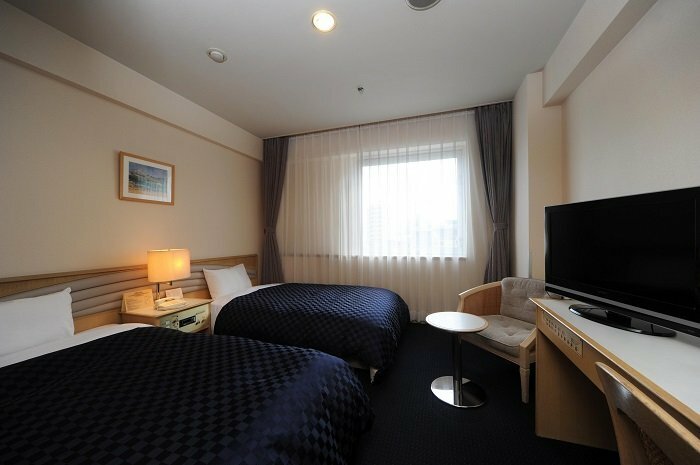 All apartments have TV, air conditioning, irons and Wi-Fi. Free Wi-Fi is available in the communal areas. 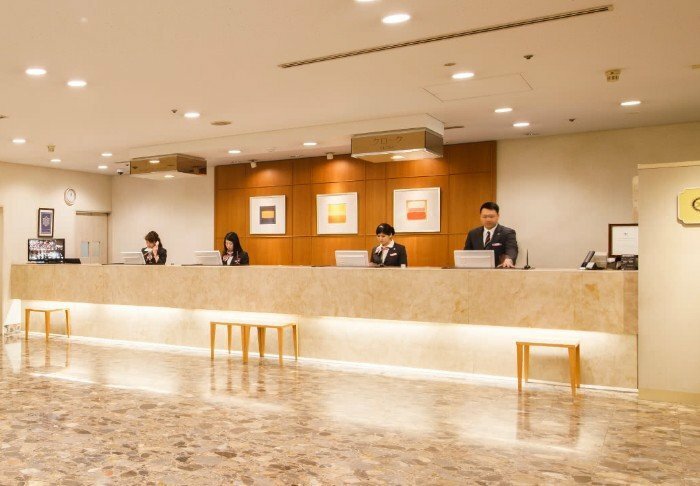 The 3-star Shiba Park Hotel is in the Minato ward, up close to the Onarimon and Daimon metro stations- Tokyo Tower is only 10 minutes away on foot. 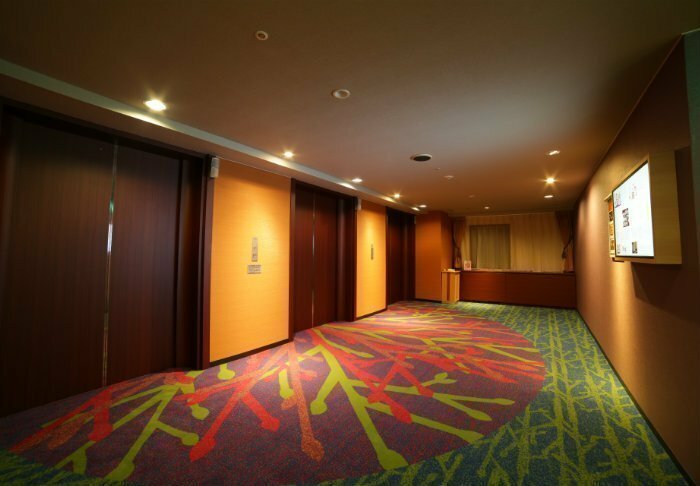 The hotel has about 200 rooms across 12 floors. 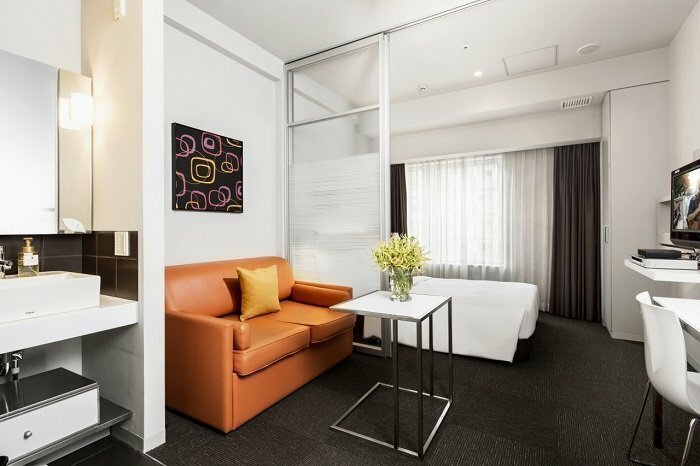 The rooms feature modern interiors with bright furniture, and feature air conditioning, a mini-fridge and flat-screen TV. The bathroom is a classic prefabricated bathroom with a toilet, a hand basin, a shower in the bathtub, a hair dryer and toiletries. 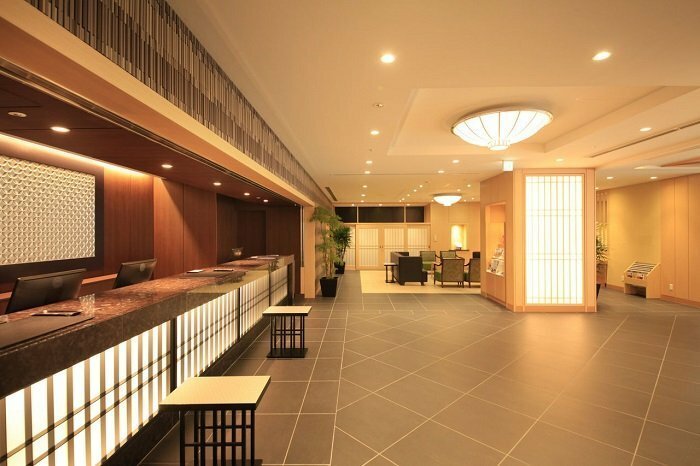 The hotel has two restaurants, a comfortable lobby with a seating area and a tour desk. 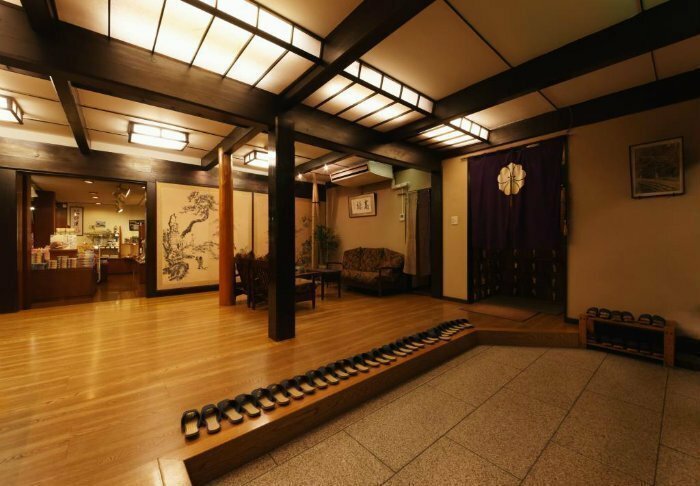 Traditional Japanese shiatsu massage is available here for a fee. Free Wi-Fi is available everywhere. 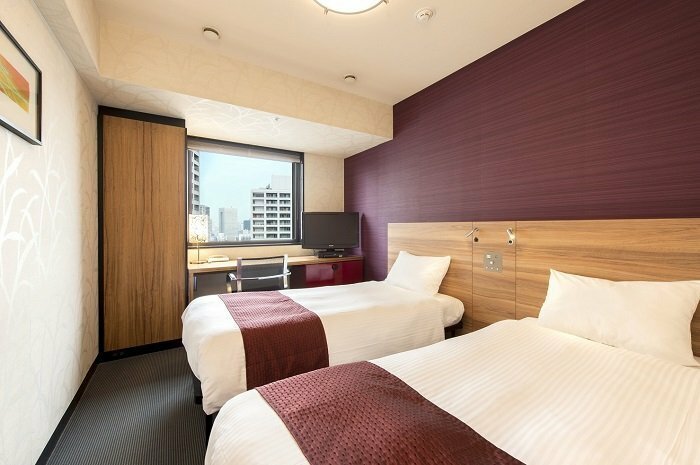 Shinjuku Washington Hotel is centrally located in the Shinjuku district, close to hip stores and restaurants, the Tokyo Metropolitan Government Building, Gyoen Park and Kabukicho, the entertainment district. 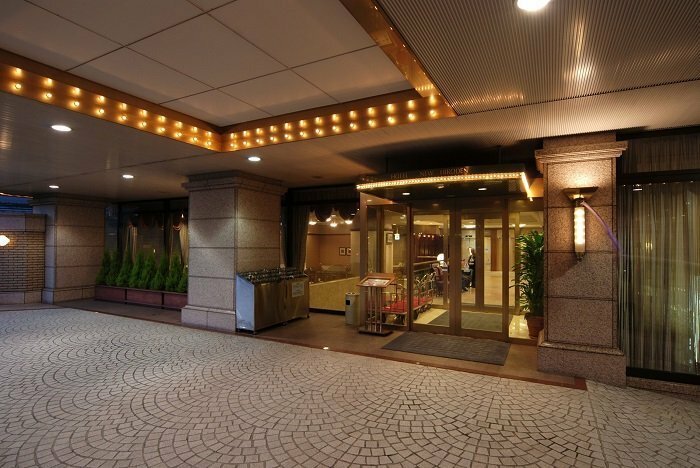 The hotel is also close to the central train station, Shinjuku-JR. 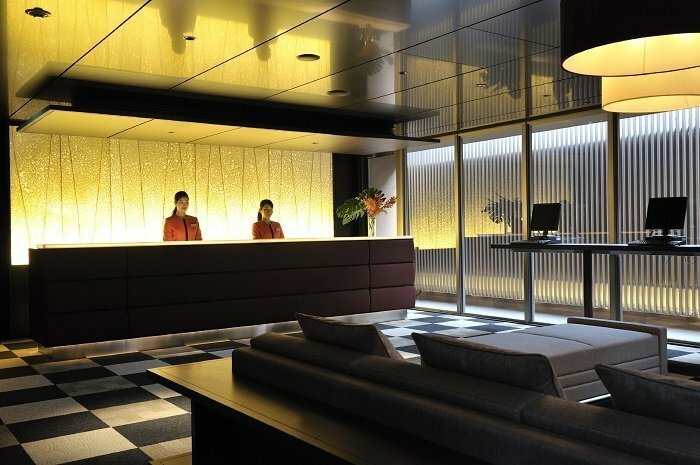 The entire hotel is the epitome of modern design, with 1000+ rooms spread over 25 floors. 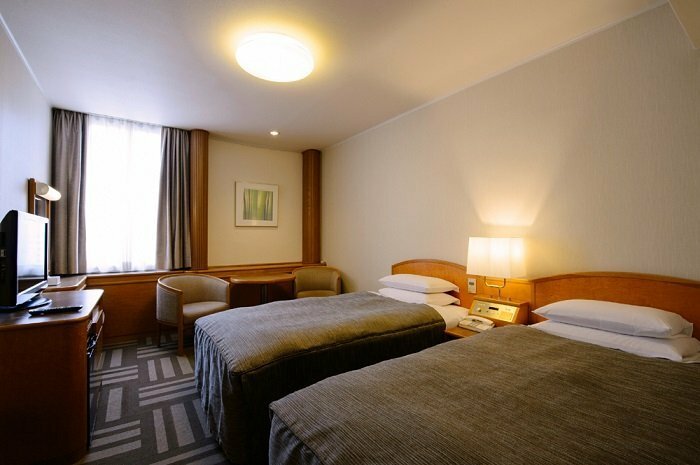 All rooms are comfortably appointed and have free Wi-Fi, air conditioning, TV, telephone, mini fridge, tea and coffee making facilities as well as a hair dryer and complimentary toiletries. 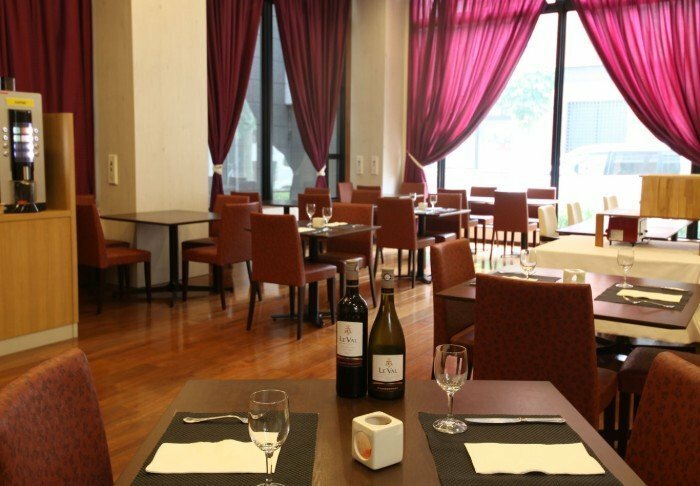 The hotel also houses a wide range of restaurants, cafés and bars. 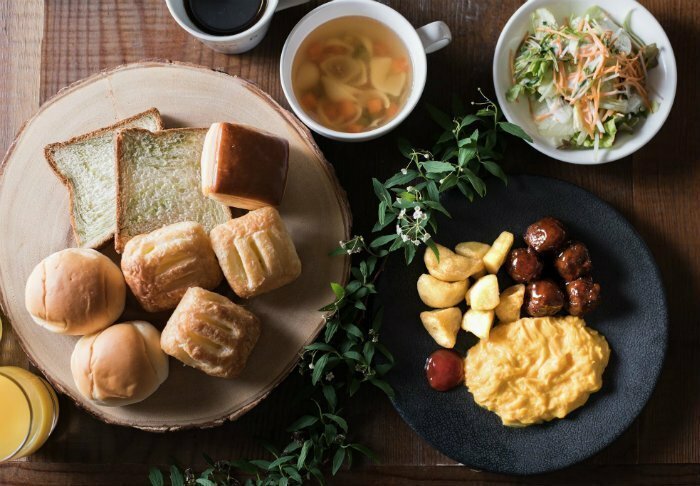 The restaurant Fujita offers Japanese specialities, while the cosy Manhattan Table Grill & Dining restaurant serves a wide selection of American grill dishes overlooking the Tokyo skyline. 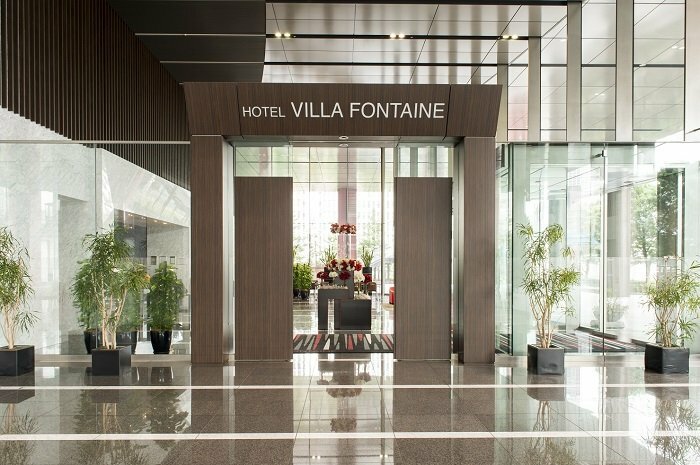 The 3-star hotel Villa Fontaine is approx. 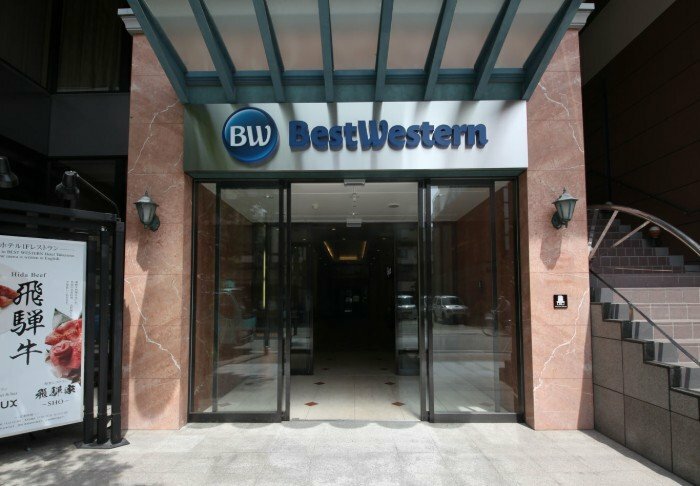 10 minutes on foot from the train and metro stations, from which there is a direct train to the airport. 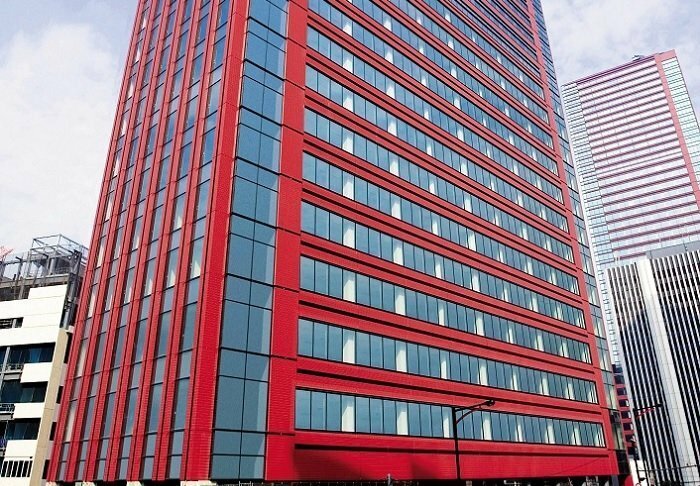 The hotel is located in a tall building, which also houses a number of offices – the hotel consists of 4 floors. There are shops and restaurants just outside the door. 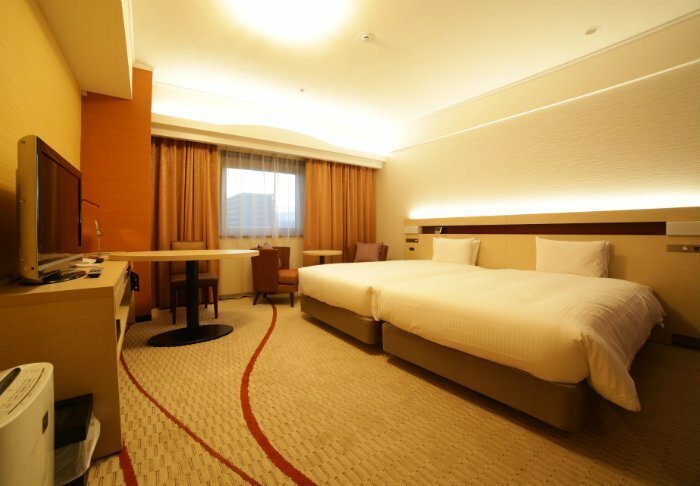 All 173 rooms feature a refrigerator, air conditioning and TV. 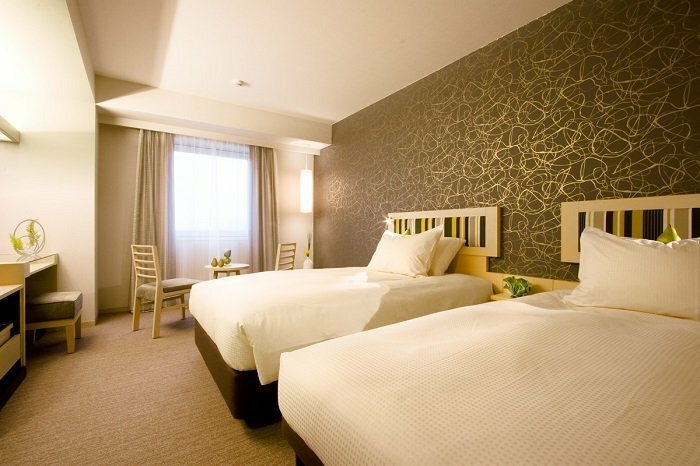 The rooms are small, but comfortably furnished in a relaxing style. 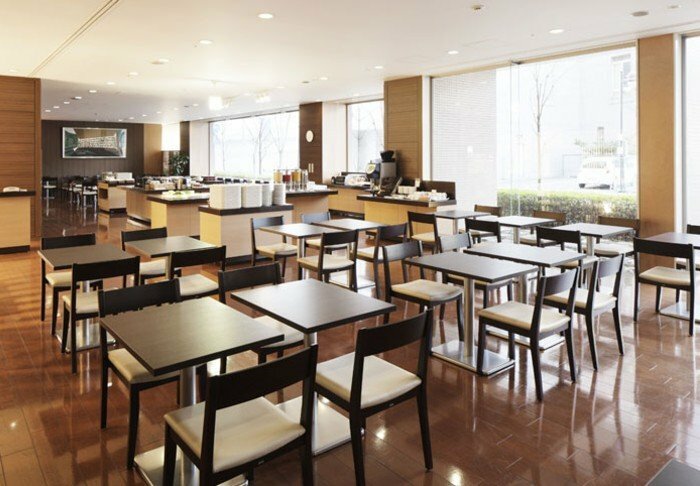 A breakfast restaurant is available at the hotel, as is free Wi-Fi and a coin laundry. 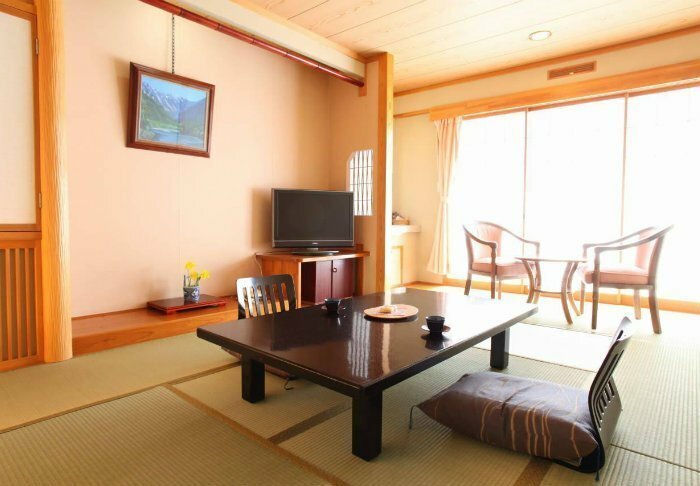 This modern ryokan is surrounded by mountains in the town of Yudanaka. 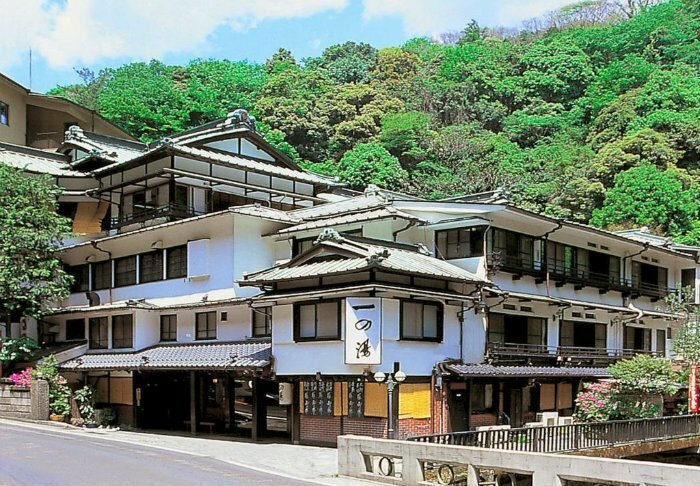 A five-minute walk from here, you will find the 25-metre-high Buddha figure, Heiwa Kannon, guarding the city. 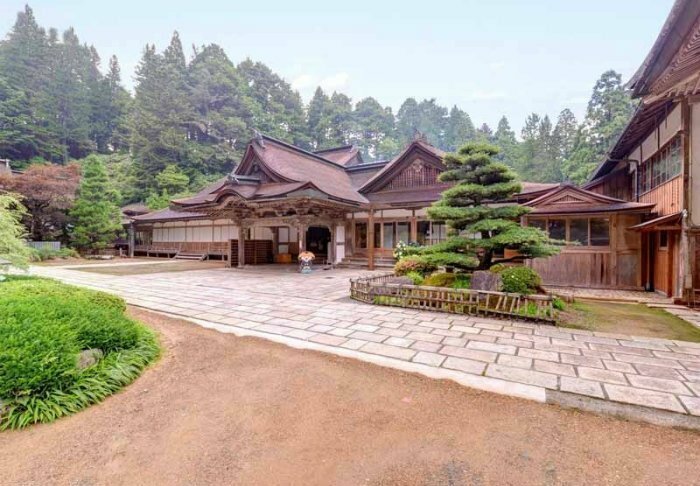 Biyu no Yado offers a free shuttle bus to and from the train station and the Jigokudani monkey park, a 15-minute ride away. 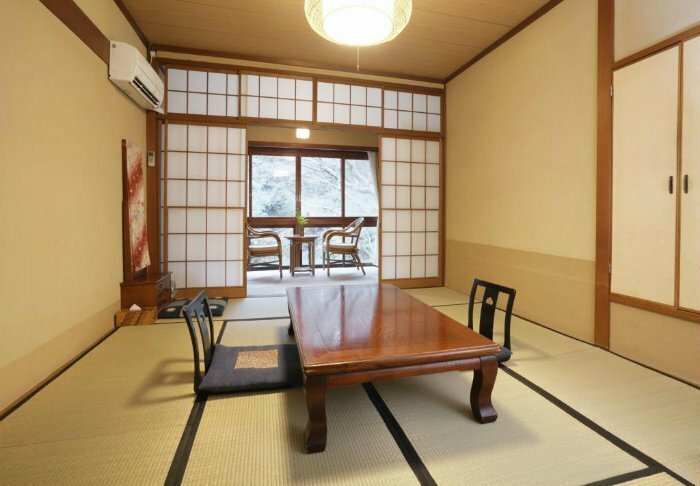 The 44 rooms are all decorated in traditional Japanese style with tatami mats, futons, shoji sliding doors and short-legged tables. 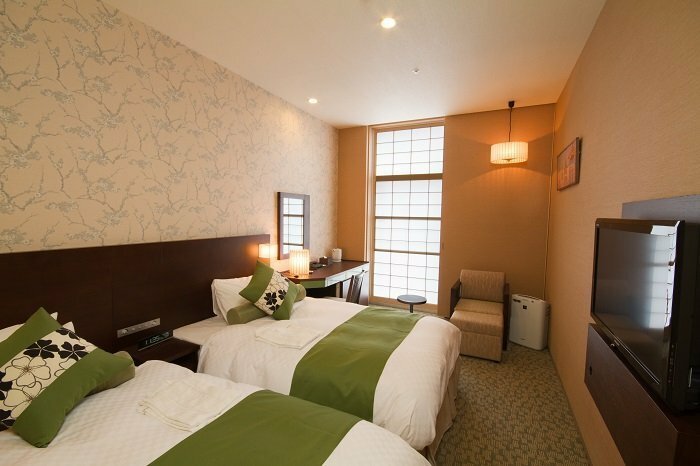 All rooms also have Wi-Fi, air conditioning, a fridge, TV, electric kettle and safe. 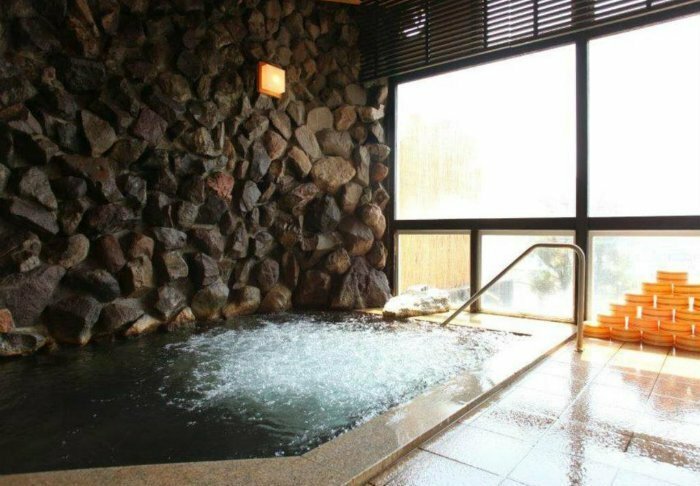 After spending a lovely day with the snow monkeys, you can follow their example and enjoy the ryokan’s steamy onsen baths. 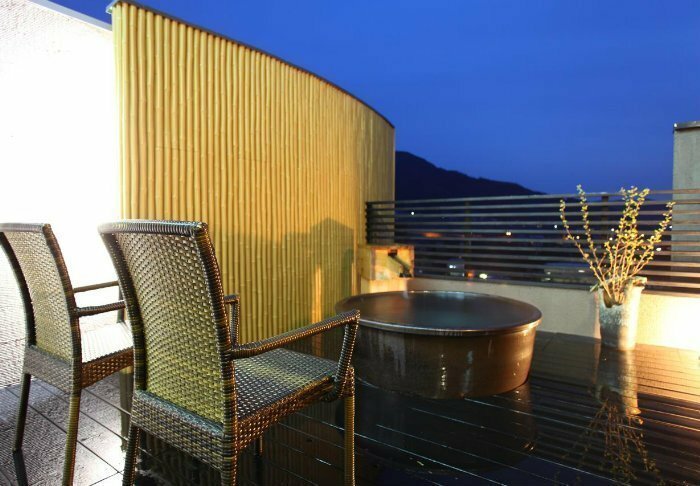 It is also possible to book the private bath on the rooftop terrace. 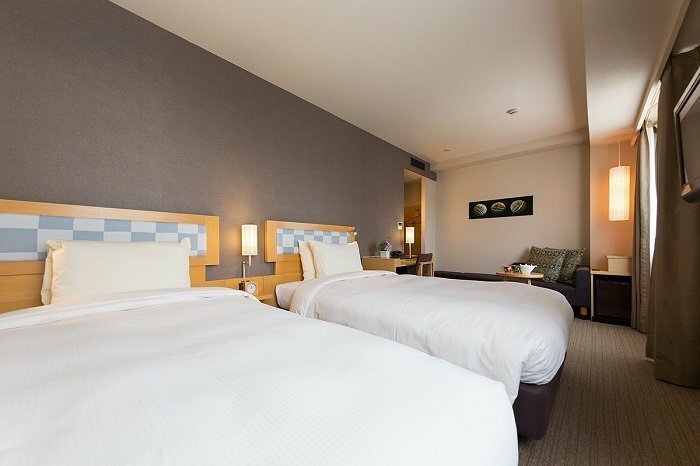 Additional amenities include a souvenir shop and a restaurant affording the most beautiful view of the area.